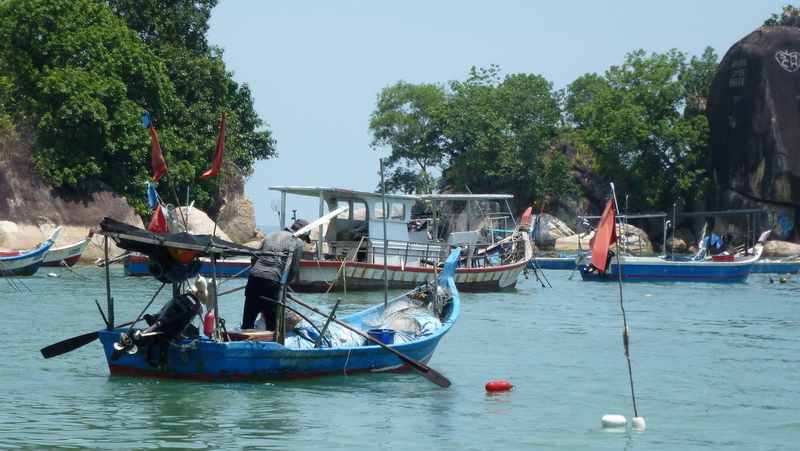 After working in the Information Technology and Consulting industry for almost 35 years, I have decided to pursue my dream of returning back to Penang – my hometown and my birthplace. Give up my high paying job as a senior project manager in Australia so I can live my dream. I am sure I am not alone here. The scary part is what would I do after I leave my job. A job that I am good at, that I am so familiar with, in the last 3 decades. I have been pondering on this idea for over a year – what could I do? do I need to continue to work in this high pressure work environment? could I earn an income by doing what I enjoy most in my life? I don’t want to sit around and keep asking and thinking to myself over and over again – could I or could I not and the what if. I do not want to die not trying and not knowing. So I have decided to take the plunge and quit my job recently – the most familiar thing in my life that I have been trained to do – to do something different while I still could. I believe everyone has the capacity to learn and to adapt. 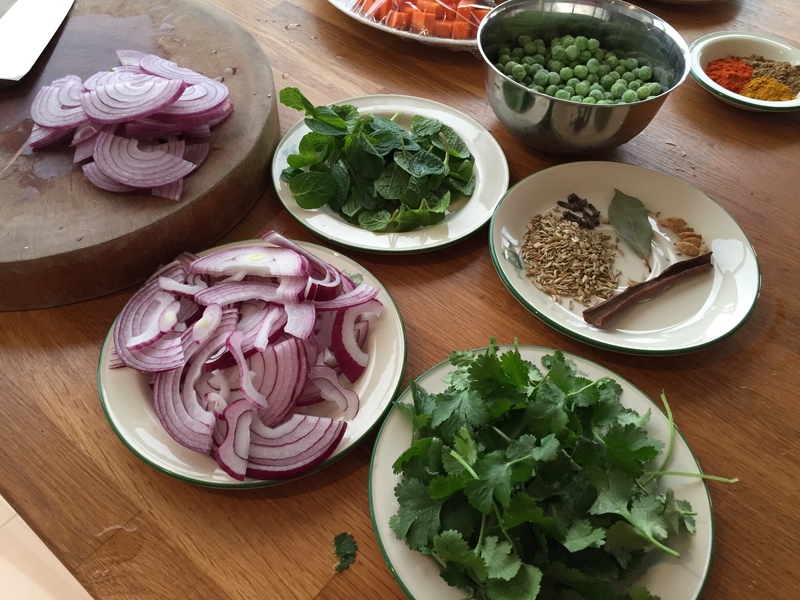 I have done it in 2006 when I opened my own boutique restaurant, refitted a takeaway shop into an Asian-style open kitchen, trained myself to cook in my own commercial kitchen, learnt the process of sourcing my own produces to plating my food on the table. It was a rewarding and fulfilling experience – being able to interact face to face with my customers, see the reaction of my customers and rewarded instantly with their feedback. However, I was drawn back to my regular job after 2 years. The reason was “money” and there were payments to be made. Twelve years later, once again I am contemplating about my work-life balance. My normal job was not fulfilling anymore. It was a means to an end. 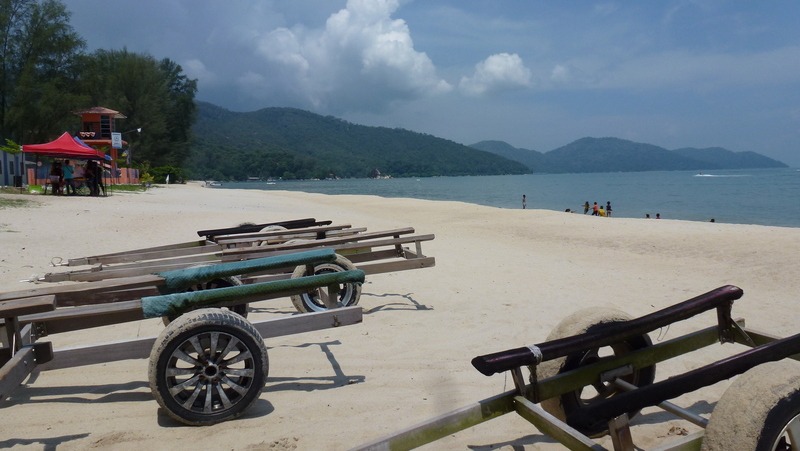 I have decided to return to Penang, to startup my own boutique travel business. In the last few weeks I have been working on my business website – Penang Insights – which is now open for enquiries and bookings. It has been a long time since I last put up a post. Life in Melbourne is very different from Hobart. It is busier. There are more things to do. 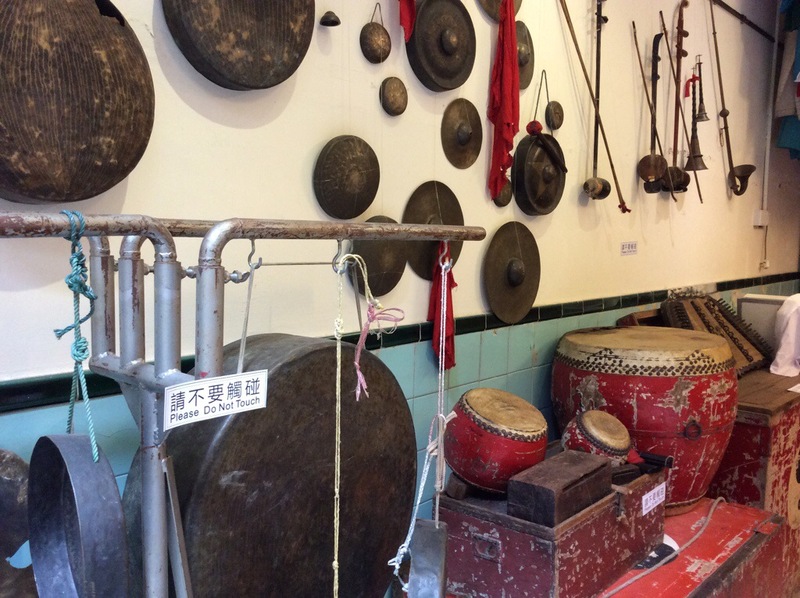 There are more social activities, entertainments and exhibitions to visit. There are more places to explore in the city – reasons to walk and to soak in the vibe of the city life and watching the street buskers. Gym and pool facility is readily accessible in the apartment building. 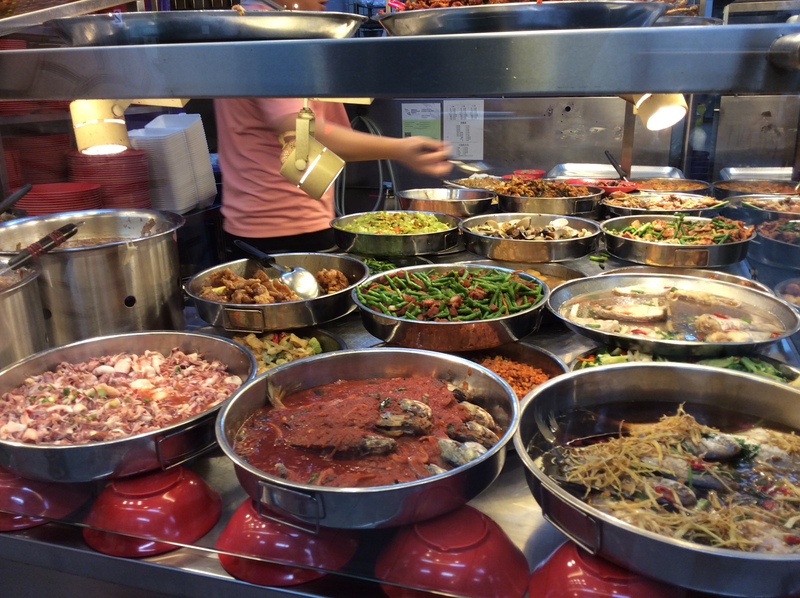 There are more choices to eat out and less desire to cook at home. 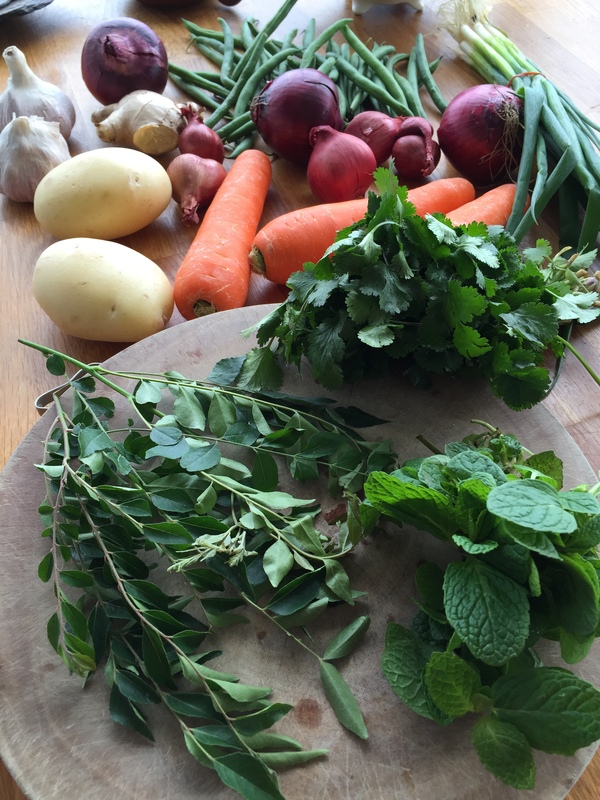 All these translate to one thing – where do I find time to blog. The answer is very little and very hard. It is easier to Instagram what I see – a single click of my iPhone 6 camera will instantly allow me to share what I see in front of me in my Facebook and Twitter, and also share with my Instagram’s followers. Blogging requires time and commitment. Time that I don’t have as much as I would like since living in Melbourne. It has to be something meaningful and worthwhile if I am going to put up another post. And, this is one of them. Hopefully you will find this post worth spending your time to read as I find it worth spending my time to write and share with you. Two weeks ago I was window shopping at Myers in Melbourne CBD. I was wondering how I should spend my shopping voucher. Should I spend it on clothing or homeware or kitchenware? Neither one of them I thought. Maybe I should browse the books section and see if I can buy a fiction novel to read. But, who would have guessed that I would end up with a new cooking book! I am one of those that will buy a cooking book and keep in the shelf and never use it. I do not have the discipline to follow the recipe. It is never accurate. I prefer to experiment my own food and my cooking style is unconventional. It is try this and that..a bit more of this and a bit less of that. It depends on what I can find in my fridge and my cupboards. I rarely write down on a piece of paper to do my grocery. It is always go with my instinct and what is available at the time at an affordable price. 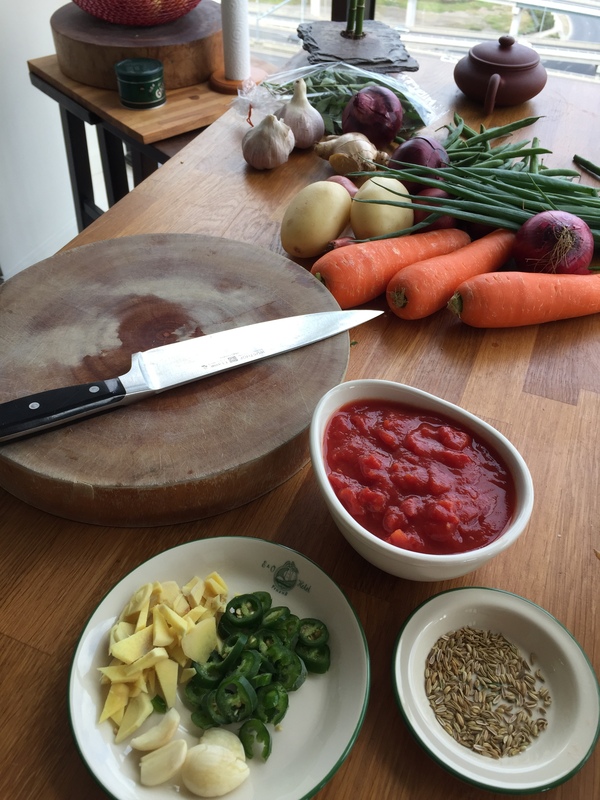 Then, I decide what to cook for the day. I will only do this if I am not cooking for a group of friends because it will either work or not work. Some time, my partner of 21 years will be so disgusted that he will refuse to eat my food and prefer to make a toast for his dinner. Like last night! So, today I have decided I will make something different to gain his trust in my food again…that I can still cook. Back to Myers, I seldom browse the recipe book section. There are too many recipe books out there. And, probably only a handful of them are really worth buying. An experienced cook can tell by reading the recipe if it will work or not. This particular one caught my eye. It has a beautiful cover and very catchy title “Curry” with 2 bright red chillies. I wasn’t going to fall into the trap of buying it for the sake of using up my voucher. 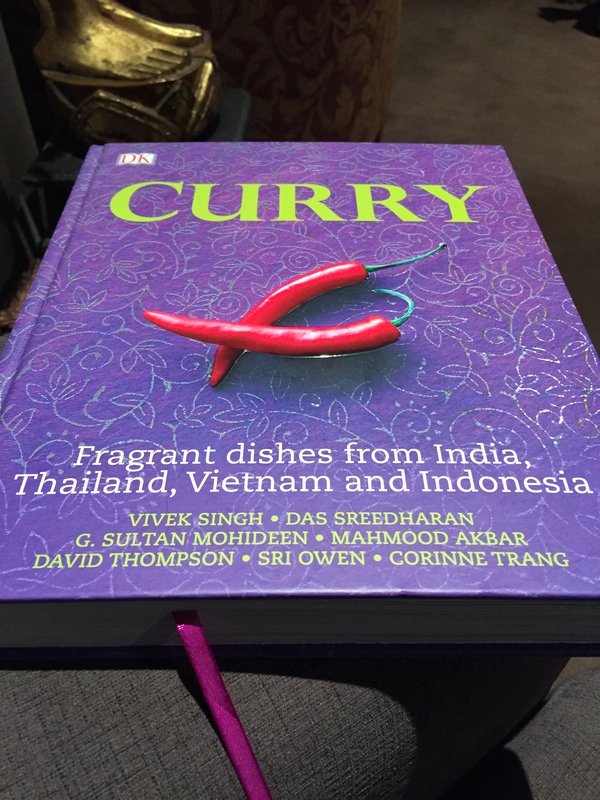 But, when I flipped through some of the pages and started reading the recipes, I was drawn to the recipe sensing the aromatic flavour and taste of the curry. I flipped through few more pages and I was convinced that it is worth buying. After all, it doesn’t cost me anything with the voucher. 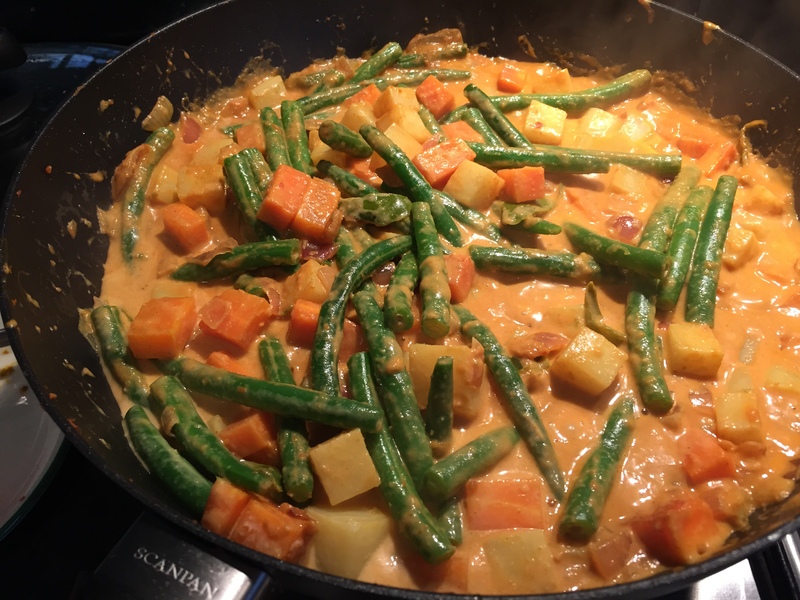 This is an experiment..experimenting the recipes from my Curry Book. This book was originally published in 2006 in Great Britain by Dorling Kindersley Limited. This version that I have bought is a revised edition published this year in 2015. I have chose 3 dishes for tonight’s dinner. I cannot reproduce any part of the book as it has a copyright. I have to admit. 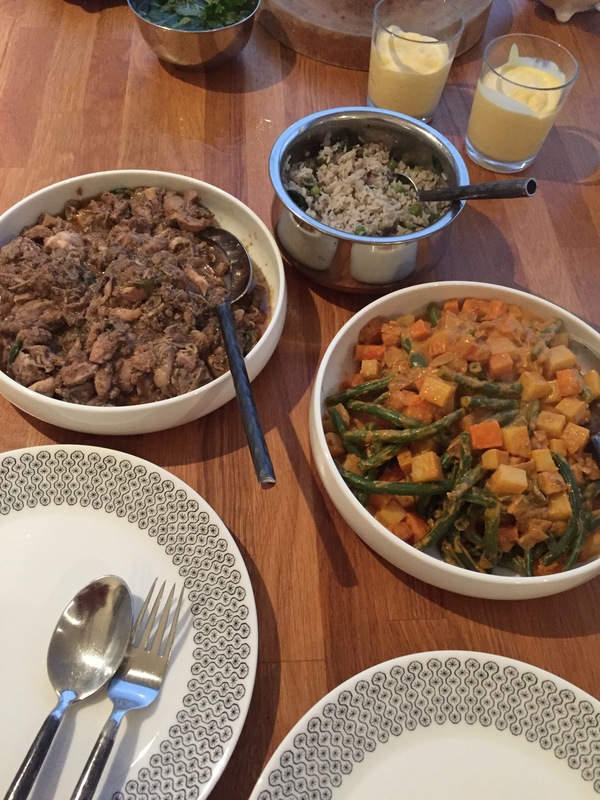 All 3 dishes turned out very well and they were delicious. As a typical me, I didn’t follow the recipe to the precise measurements. I have adjusted some to my liking and to my taste. 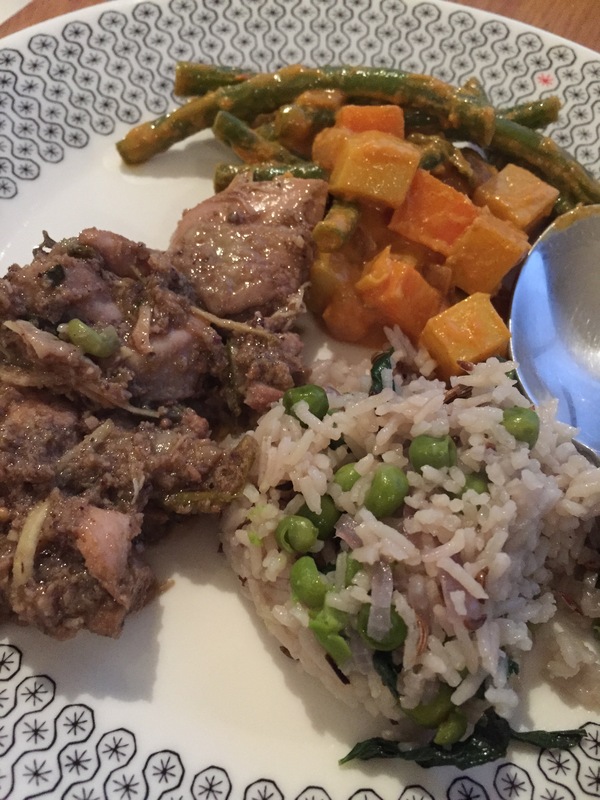 I used chicken instead of lamb for the “kerala dish”. Otherwise, all the ingredients were there in all 3 dishes. 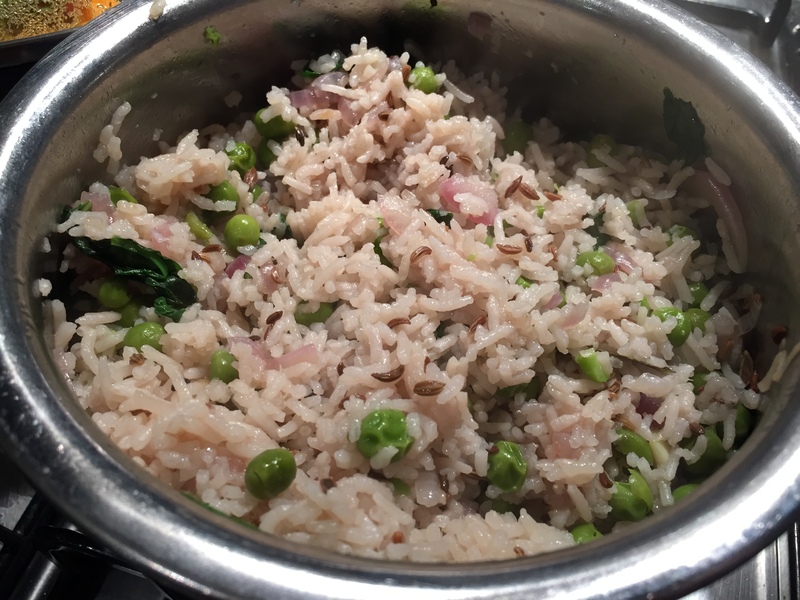 Mutter Pulao is a delicious fragrant and spiced rice. 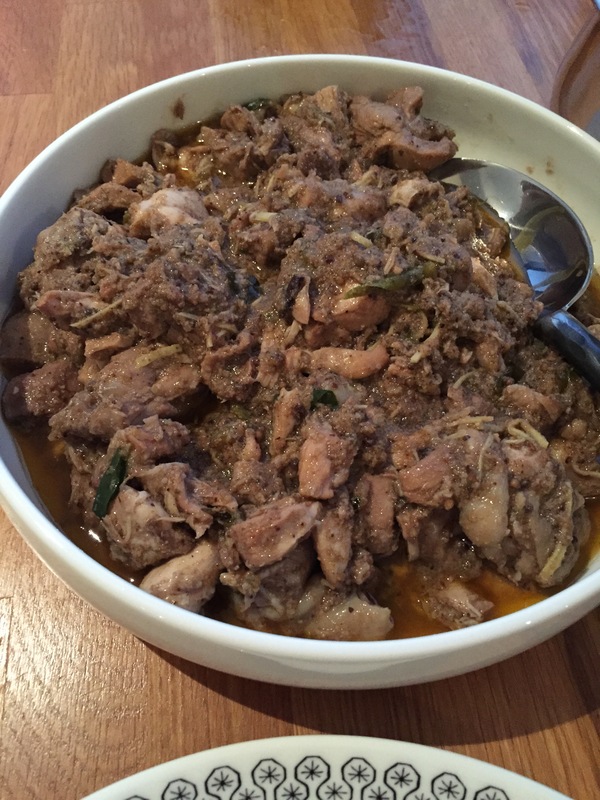 Kerala Chicken is a dry curry dish. 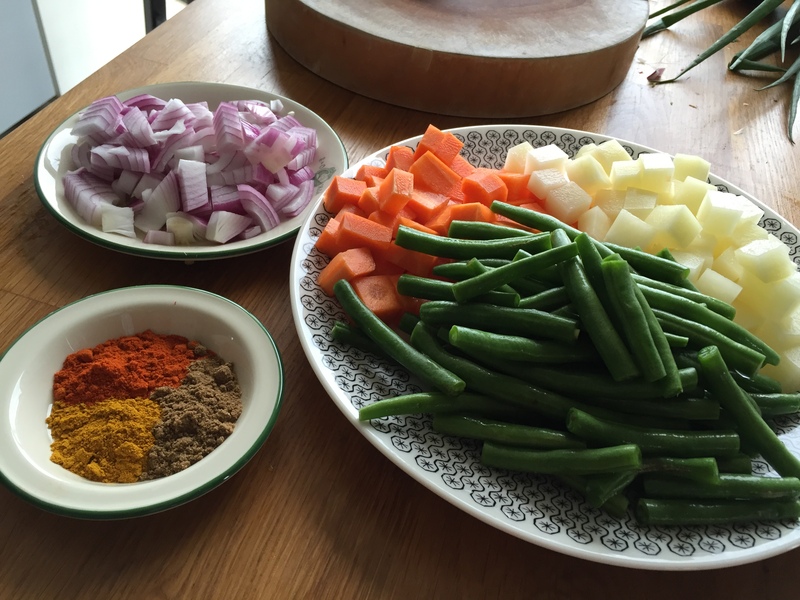 It is the most complex dish among the 3 and requires the most time to prepare. 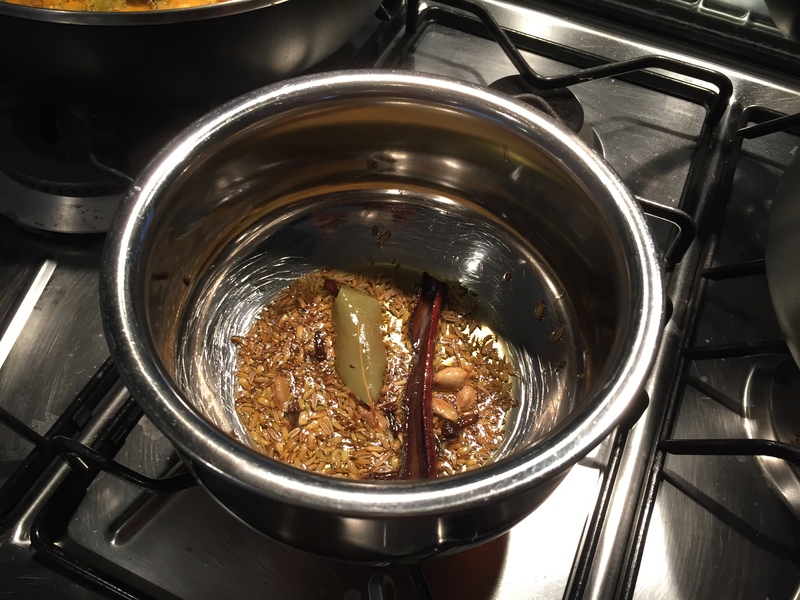 It involves dry roasting the spices and blending into a spice paste. 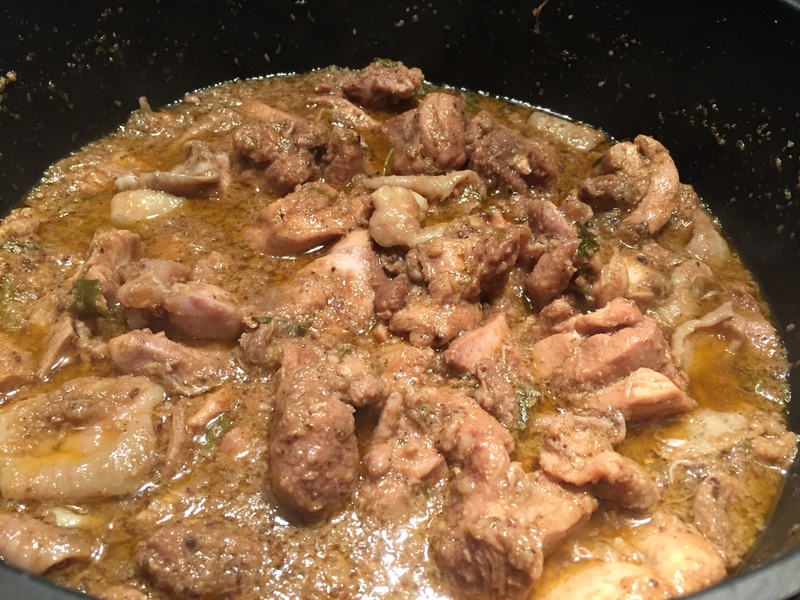 It takes time to simmer down and reduce the curry until it is almost dried before ready to eat. 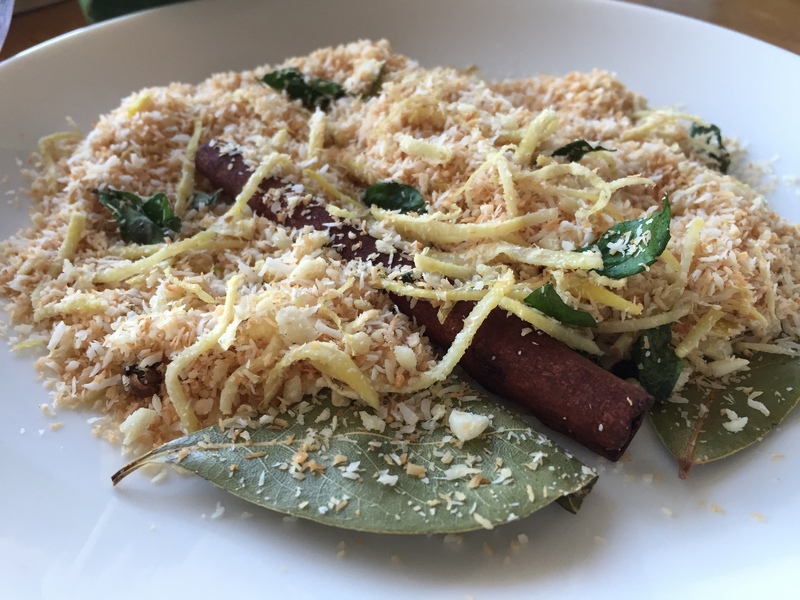 I have modify this dish a bit by adding more fresh ginger slices and fresh curry leaves at the end. Sprinkle a bit more sea salt and brown sugar to taste. It is a lovely dish. I will try using lamb next time as called in the recipe book. Rasay Kayi is probably my least favourite among the three. Probably I haven’t done it correctly. I have followed the recipe but I suspected I should have gone with my own instinct to modify the recipe a bit to suit my taste. Don’t get me wrong. It is still tasty. But the recipe was a bit ambiguous to follow. The verdict. My other half love tonight’s dinner. “It’s a restaurant quality food”. I even made my own mango lassi to round up my curry night dinner. 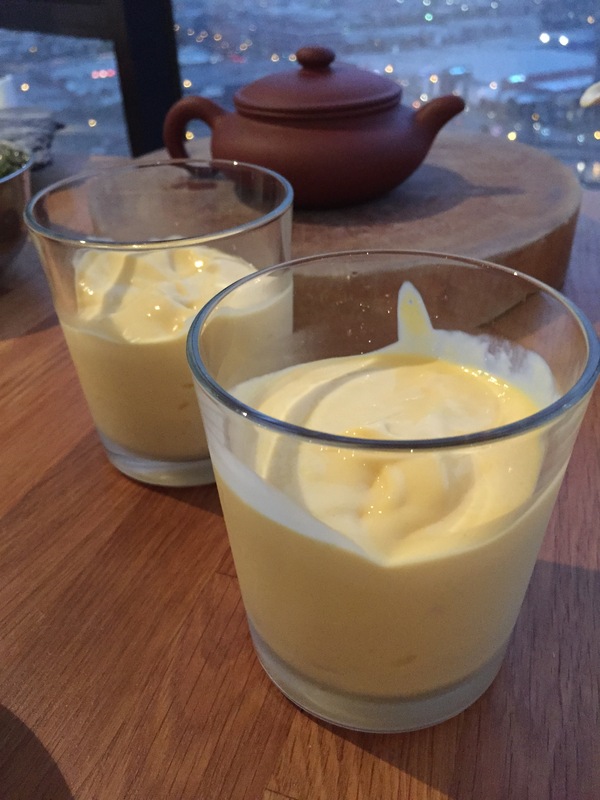 Nice, thick and creamy with frozen mangoes, yoghurt, milk and honey. If there is one recipe book that I will recommend. This is it. And, if you love curry like I do. Don’t hesitate. Go and buy yourself this recipe book. It is worth spending the money. 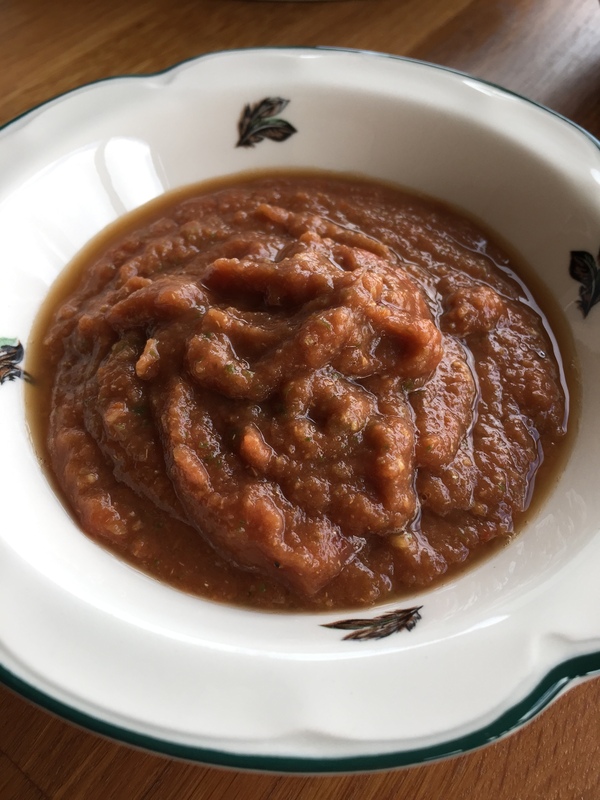 Next time, I will try the other recipes in the book and if the weather is as cold, wet and miserable as today, I will confine myself in my small kitchen, cook and give you my verdict on the recipes. All photos were taken using my iPhone 6. 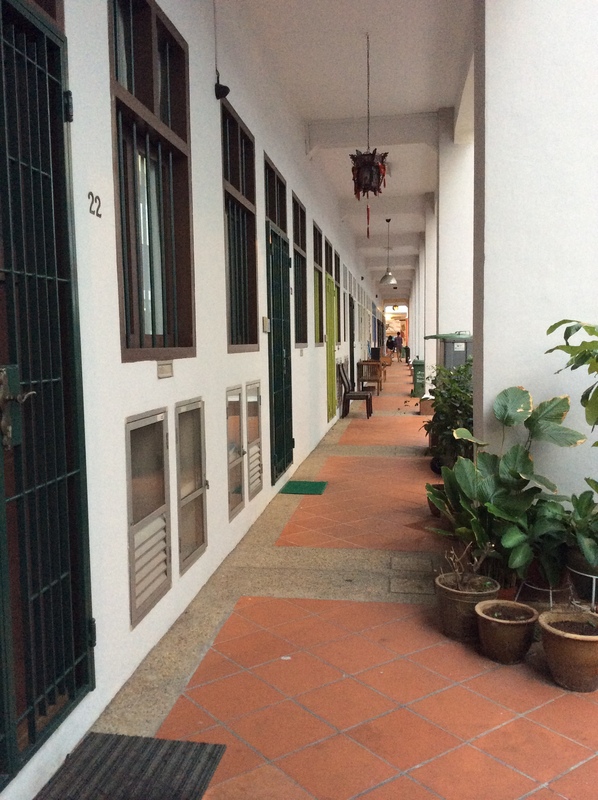 I never expected that I will really enjoy my overnight stay in Singapore. It was a stopover transit on my way back to Melbourne. 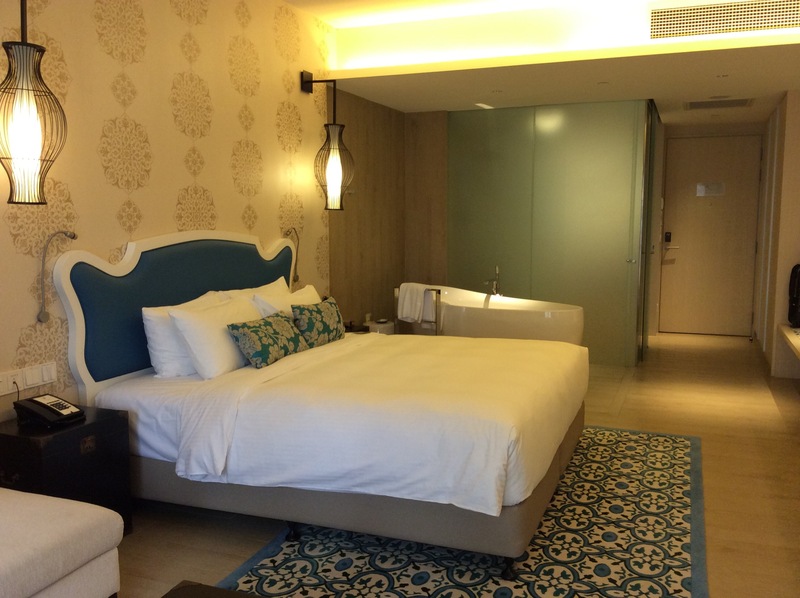 I did some research on the hotels nearest to the Changi Airport and came across Village Hotel Katong. My requirements are simple – hotel must be nice and clean at a reasonable price and walking distance to shops and food outlets. Everything else doesn’t matter as it is only an overnight stay. 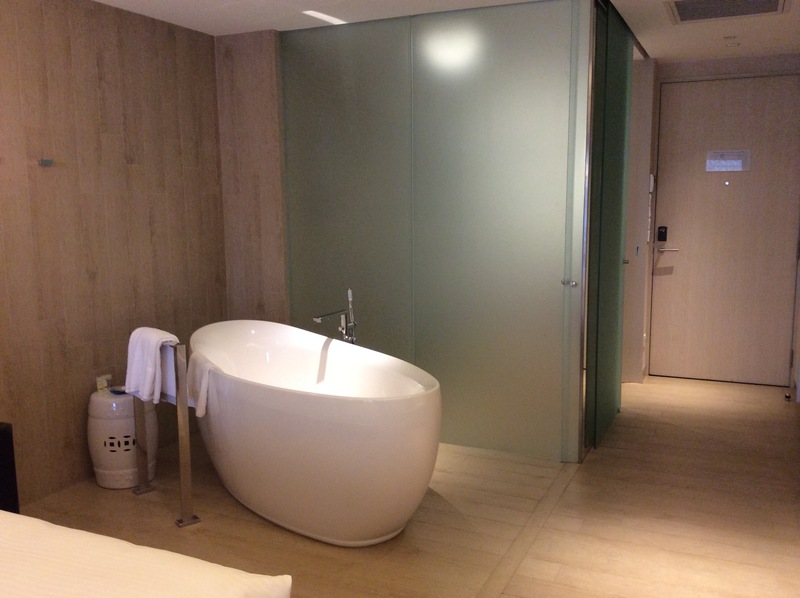 On arrival at Village Hotel Katong, it was more than I expected. The hotel is new. The lobby area is welcoming. The Front Desk staff friendly and efficient. I was offered an upgrade to the club package which includes the use of the club lounge, breakfast and a gorgeous large room with a free standing egg shell bath tub in the living area of the bedroom. All these perks at an extra Singapore $50. After check in and settling into my room, I freshen up a bit, went to check the club lounge and hotel facilities. Then, went for a walk along the main road, East Coast Road, in search of something to eat. There are a number of modern cafes, restaurants, open bars and a handful of traditional shops, including one which will stay with me for a long time. 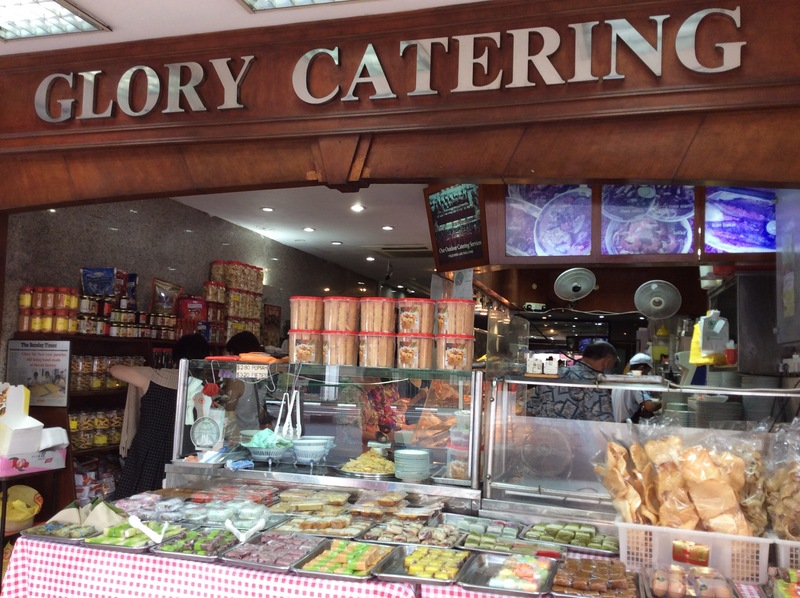 This one, with a big signage “Glory Catering”, has a selection of homemade nyonya kuih on a stand in front of the shop. 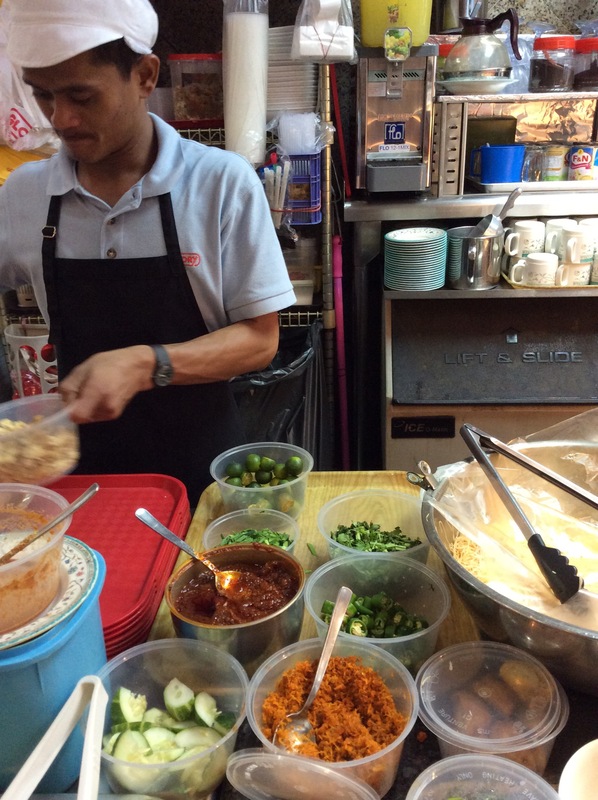 Behind the stand is the Poh Piah station and the main food counter selling a range of Indonesian nasi padang curry dishes, noodle dishes from mee siam to mee rebus and nyonya laksa. Everything looks delicious. 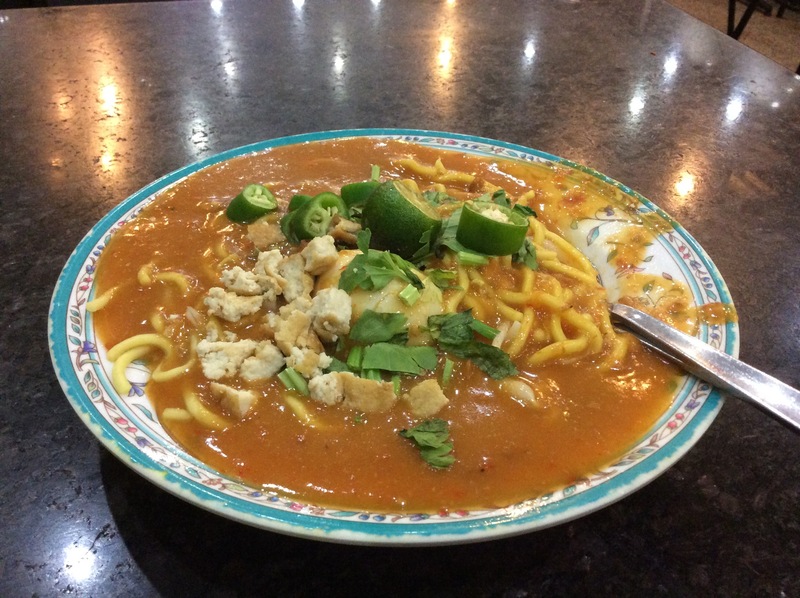 I settled for a bowl of “mee rebus”, which I haven’t had for many, many years. 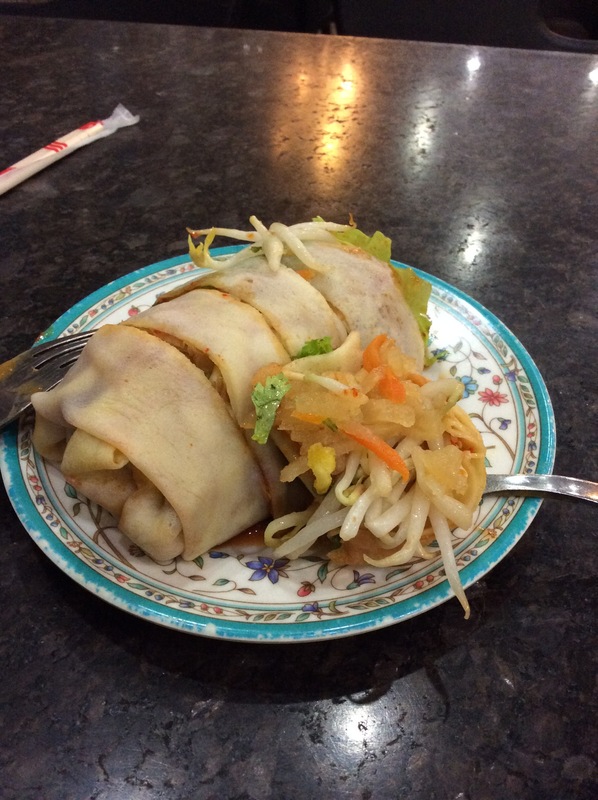 I also ordered one serve of poh piah. Drink a homemade barley as a cooling drink. I knew the food will be good as I stepped into the restaurant. It’s raw and authentic. It is nothing like one of the modern establishments down the road. But, what I didn’t expect was that the food and drink I had were more than just good. They were much, much better than I expected! 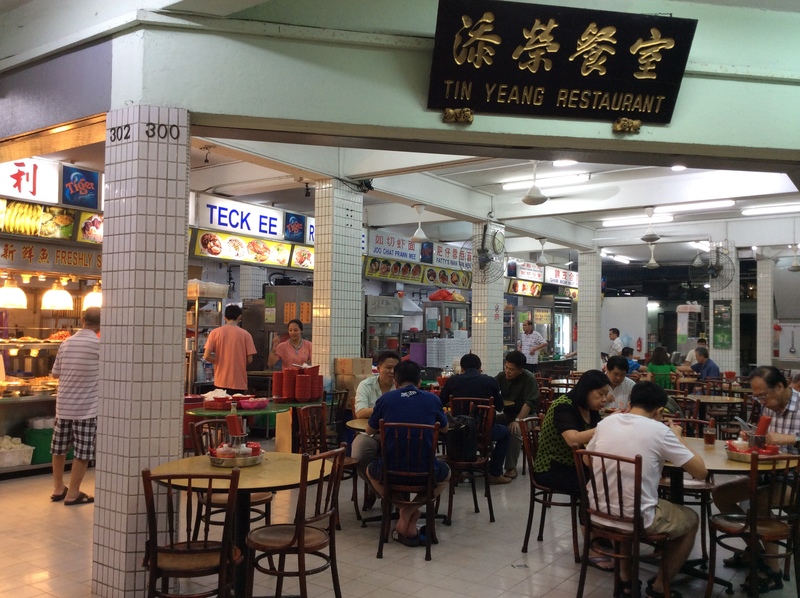 If I were to live in Singapore, I would have to go back again and again to eat at this place, or to take home some of the poh piah to snack. 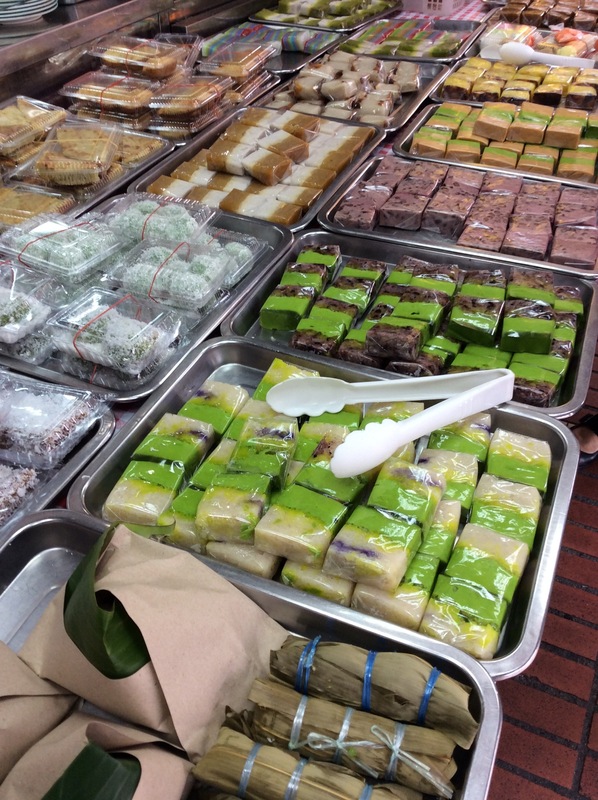 The nyonya kuih were delicious too, which I had to take away 2 slices to try. The food and drink cost Singapore $8.20 and the two pieces of kuih cost Singapore $1.20. Unbelievable. 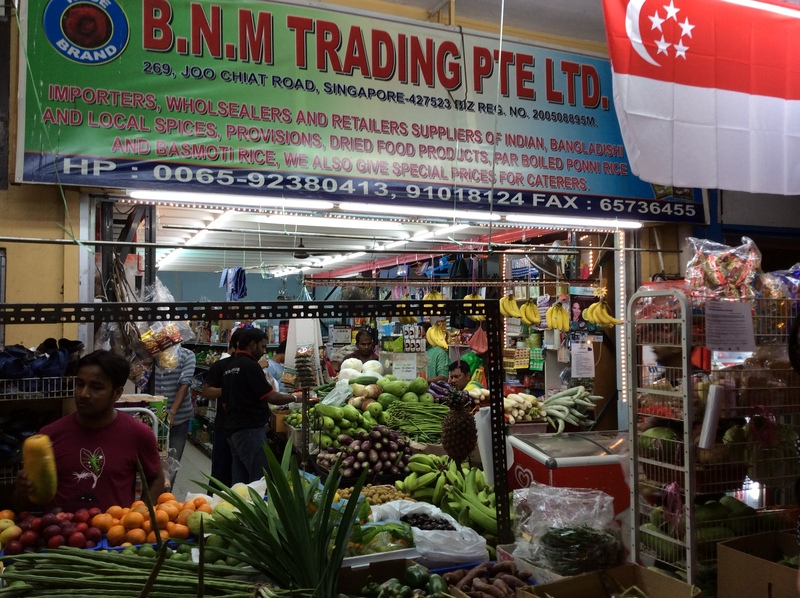 I never knew such good food and price still exist in Singapore. As I left, I had to tell the “uncle” and “auntie” that I really enjoyed the food. 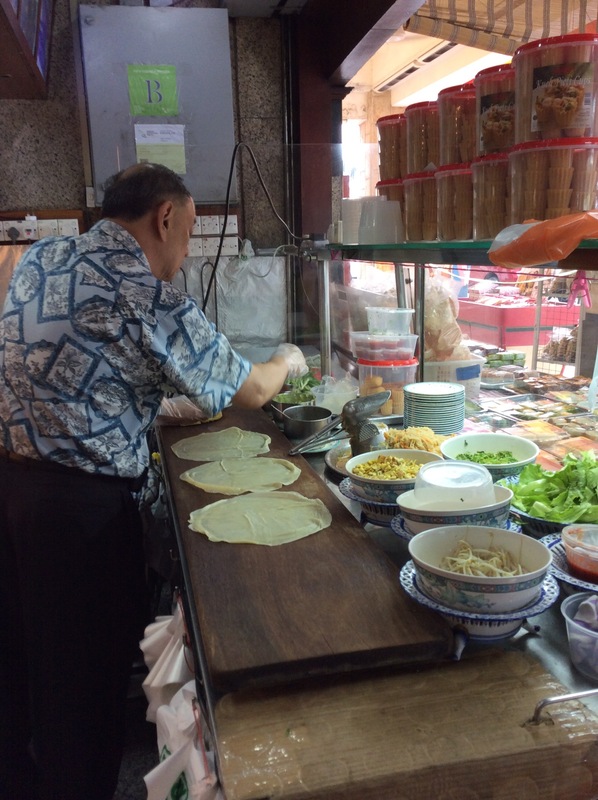 The uncle who was making the poh piah was well dressed. He told me that he has been making the food for over 40 years! It looks like a family establishment that has been passed down a few generations because the taste and flavour are very authentic. 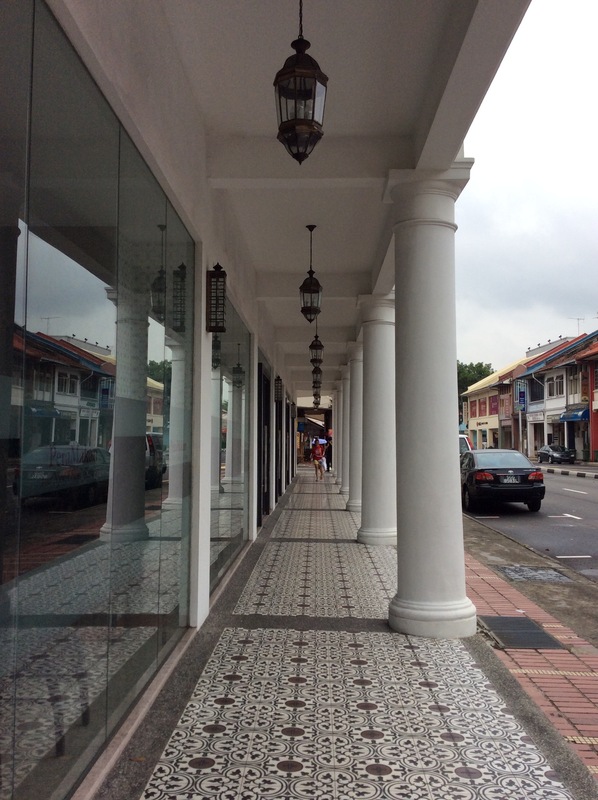 I am impressed with Katong district. 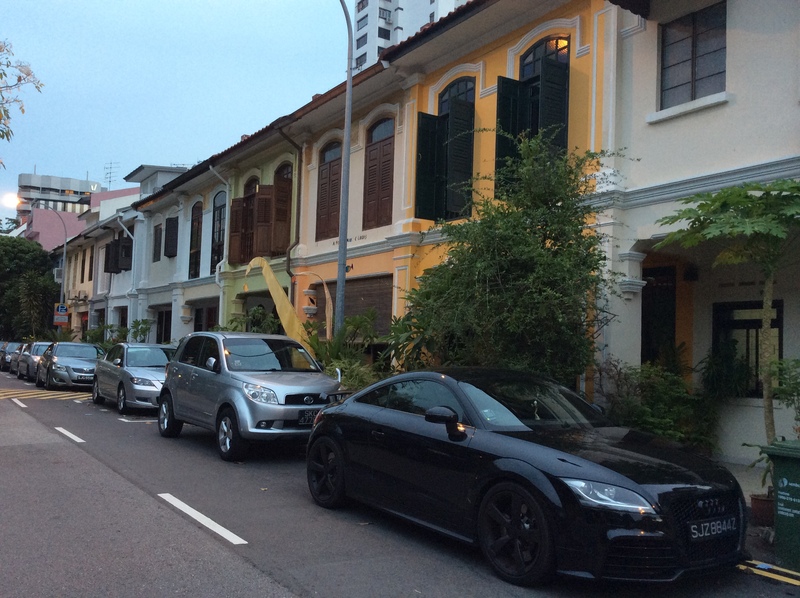 Walking around the neighbourhood streets is interesting. 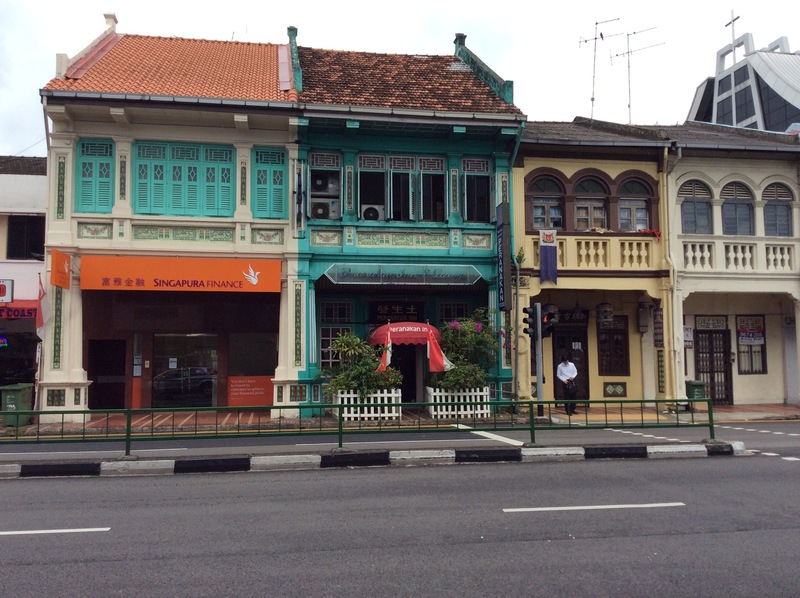 They are clean and green, beautiful “peranakan” terrace houses and bungalow houses. The area looks wealthy. 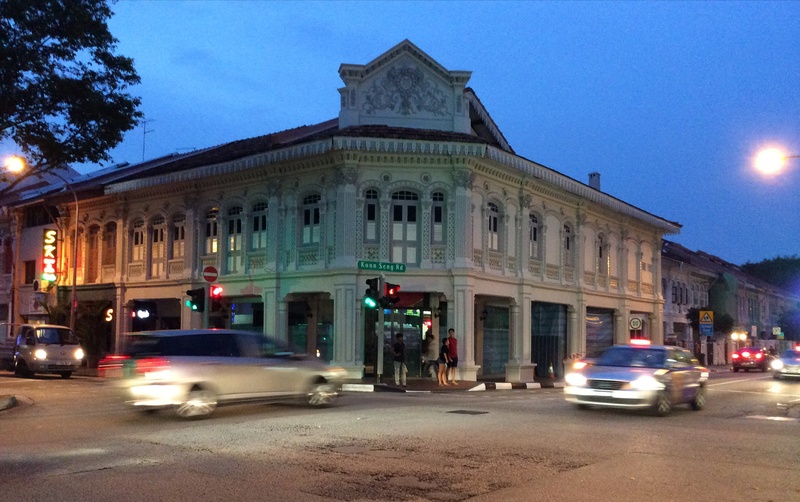 It is a far cry from the hustle and bustle of glitzy Singapore city. 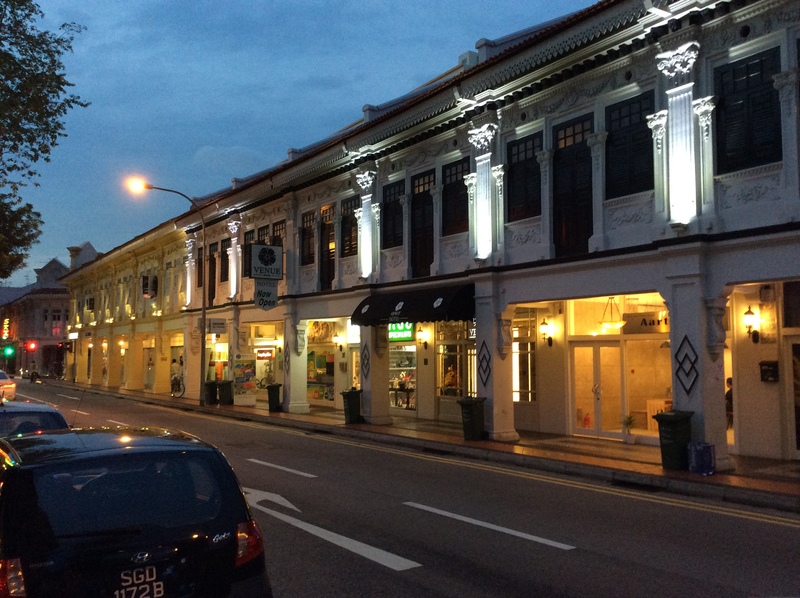 In the evening, I walked a bit further and came across “Joo Chiak Road” which is a long stretch of road dotted with bars, karaoke nightclubs, restaurants and and Indian’s grocer! This is old and new Singapore. There were a number of expatriates drinking at some of the open bars. The karaoke nightclubs are completely “black out” on the outside. They looked sleazy. 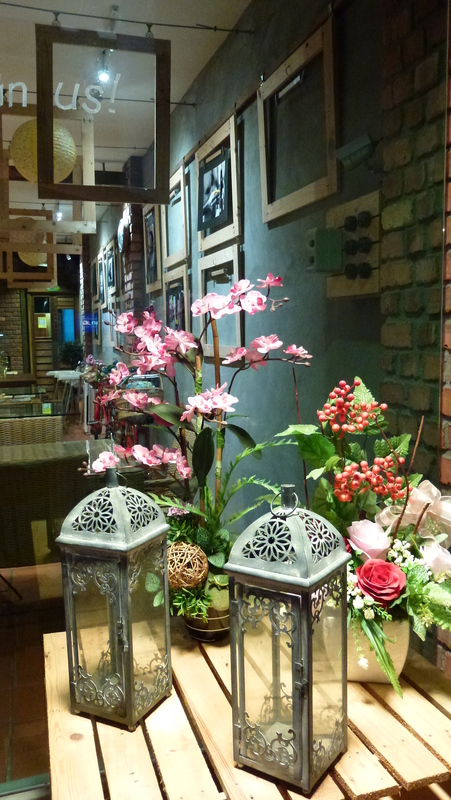 I had a simple traditional Chinese open air restaurant serving a range of dishes. 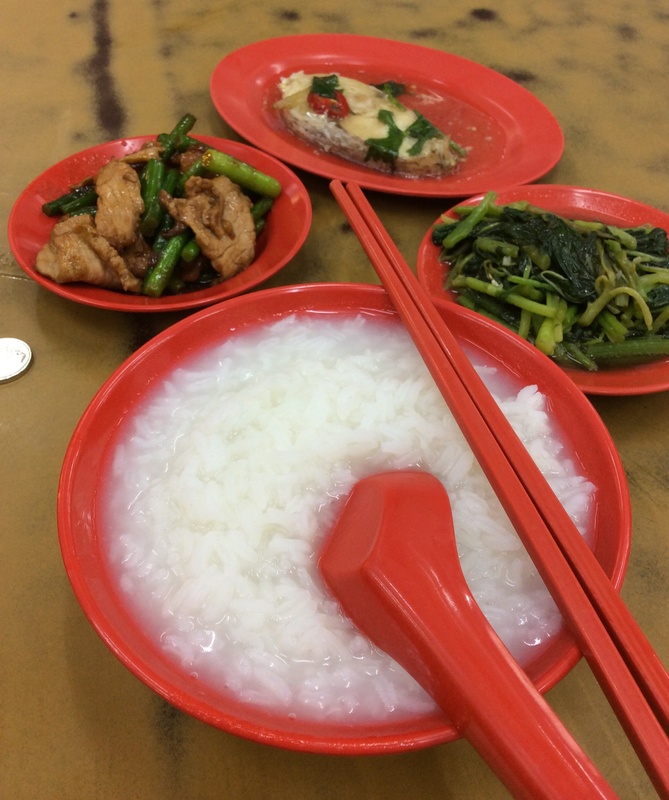 It was a nice and simple dinner that cost only Singapore $6.50 and the barley drink $1. 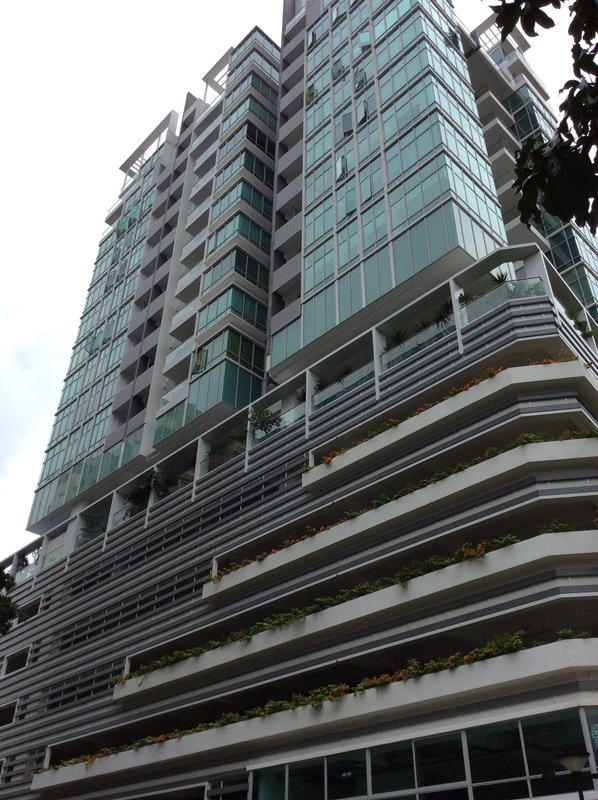 Singapore is affordable if one lives outside the city. 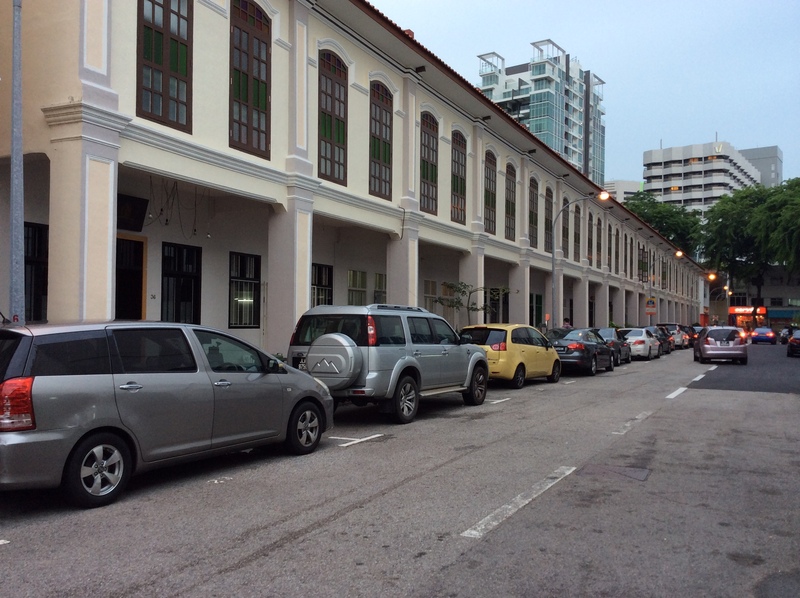 Every time I went back to Penang, I will made it a point to walk around the old part of George Town. There is always something new to discover – whether it is a street art, cafe or shop. This time, there is no difference. I found a few new places. It was only 4 months ago since I walked around the old town. 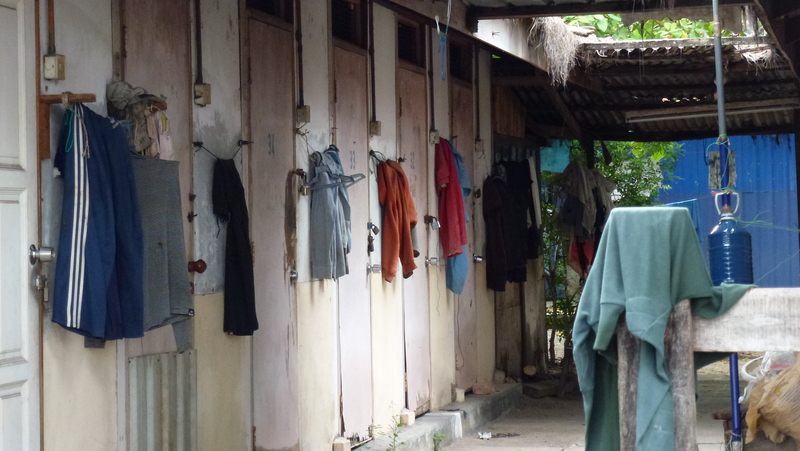 It is easy to walk around the little streets and back lanes of old town. Some streets are busier than others. The motor vehicles usually moves at a slow pace due to the narrow streets. It is quite safe to walk or to cycle. 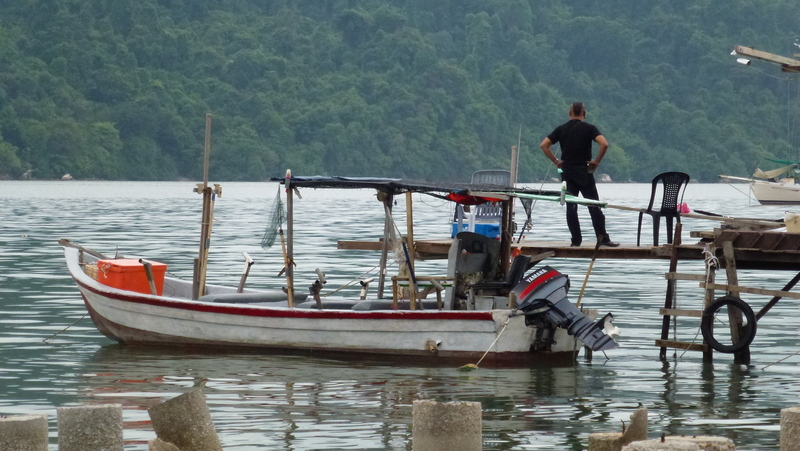 There were many local and interstate tourists, Chinese and Malay alike, when I was there. I was told it was the school holiday. People were walking slowly and some were on hired bicycles. Most of them were looking for Penang’s famous street arts. It’s like playing a “hide and seek” find me if you can. 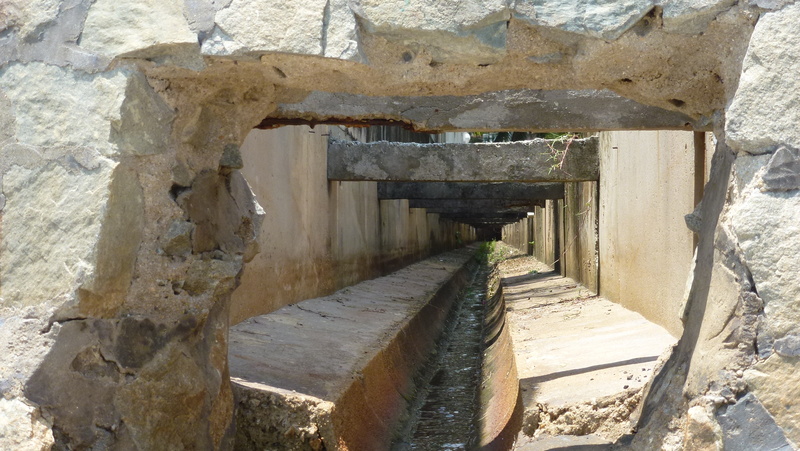 In the hot and humid weather, it is not ideal for those who cannot take the heat. Some Chinese women were holding an umbrella sheltering from the heat. Their thinking is that “dark” is not “beautiful”. Fair skin is “nice” and perceived as an educated and refined lady. Dark skin is associated with “hard life” doing hard labour work underneath the sun. To me, that is nonsense. Some were born with a darker complexion that others. Some prefer to sun-bathed and have a nicer tone to their skin colour. After all, some sun is good with a bit of vitamin D.
Yesterday I walked around the old town for almost 3 hours. I took my time to explore the area with a little break now and then for a refreshment and snack. I found a nice traditional Cantonese pastry shop where they make a variety of “piah” (chinese biscuits) filled with sweet and savoury ingredients, “pau” (dumplings) and Chinese herbal drinks. All freshly made on the premise. I found some street arts that I have missed previously. 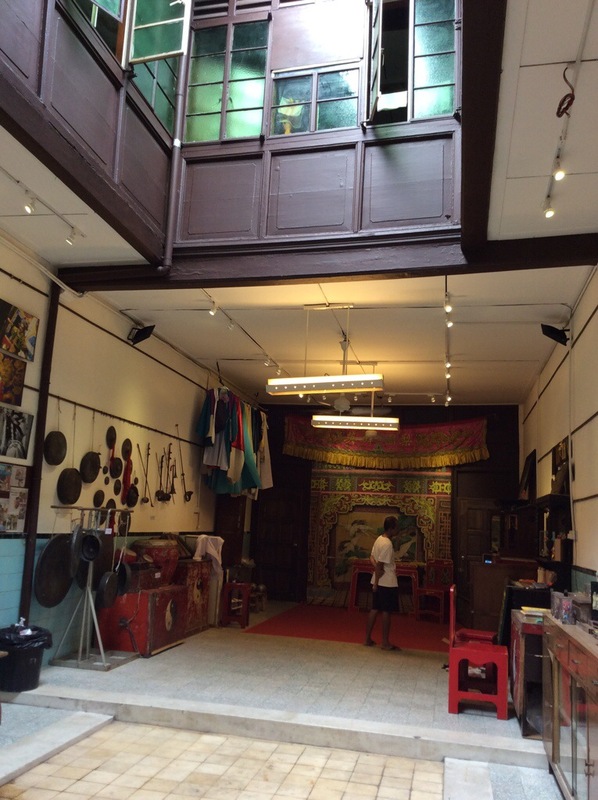 But, the most interesting find of all has to be the Teochew museum located at 122 Armenian Street, George Town. 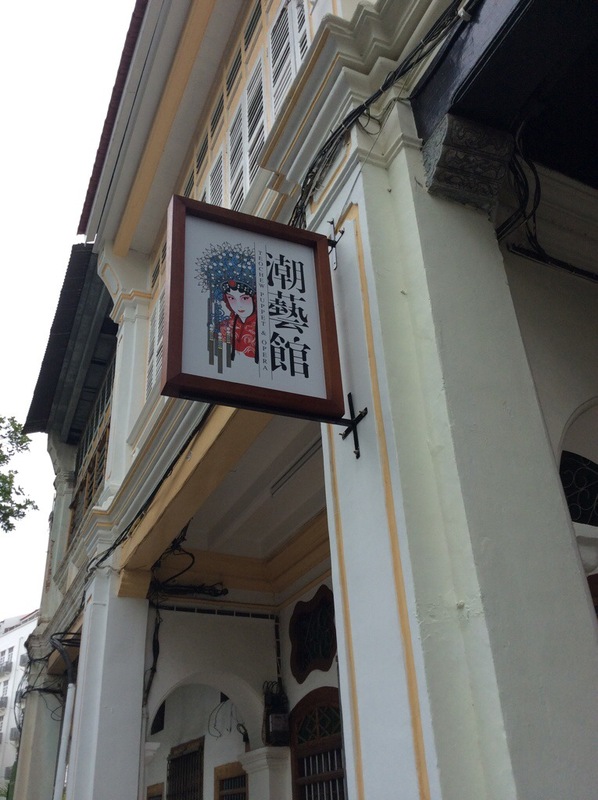 The place is called Teochew Puppet and Opera House. 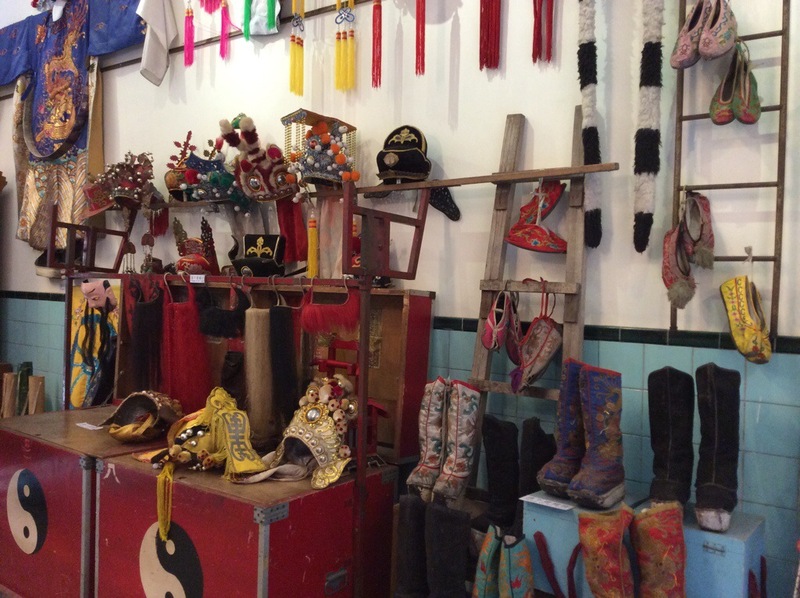 It has a wide collection of iron rod teochew puppets, full dress costumes and head gears, musical instruments and an opera stage for scheduled live performance. 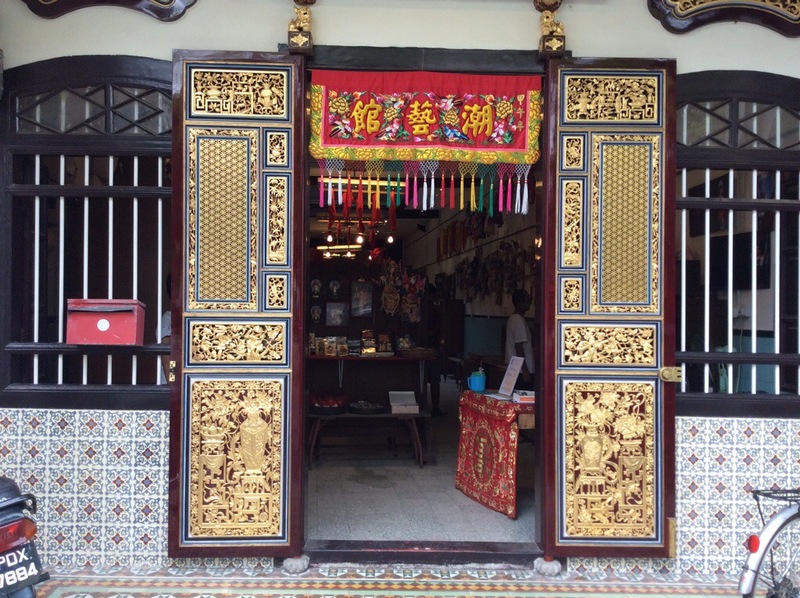 Teochew opera is extremely popular in olden days of Penang and usually performed at an outdoor mock-up stage to coincide with some religious festivals. 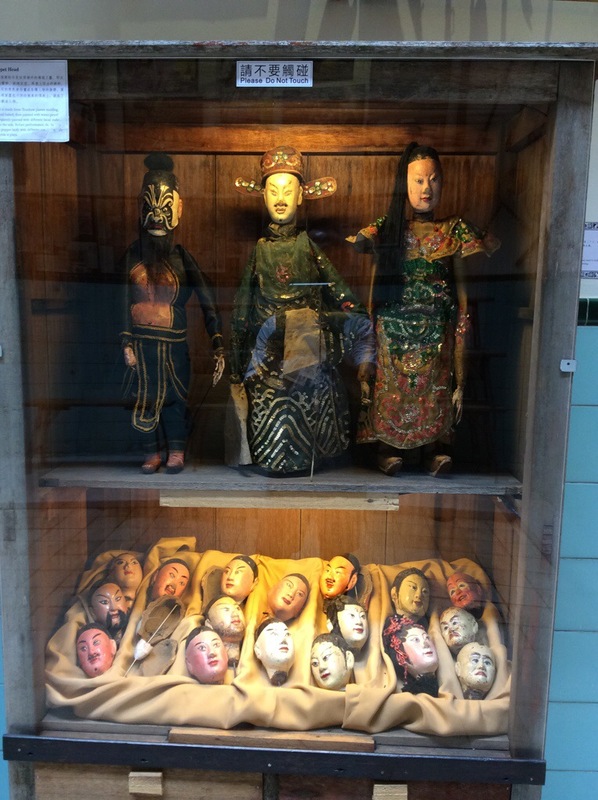 The performances are not only for the human but for the Chinese deities and the “after life”. 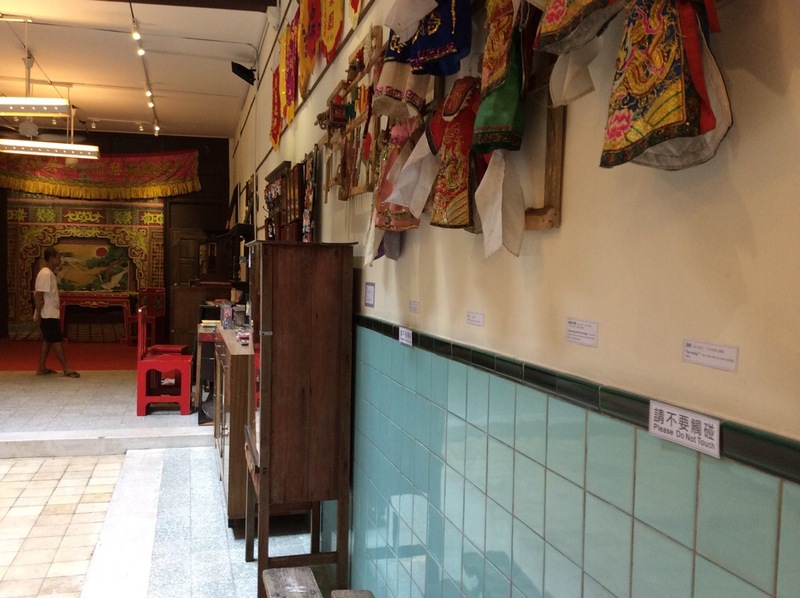 I am glad to see a place like the Teochew Puppet and Opera House, which brings back the culture and heritage to the main stream, housed in a prewar terraced double storey shophouse in a heritage protected zone area gazetted by UNESCO. 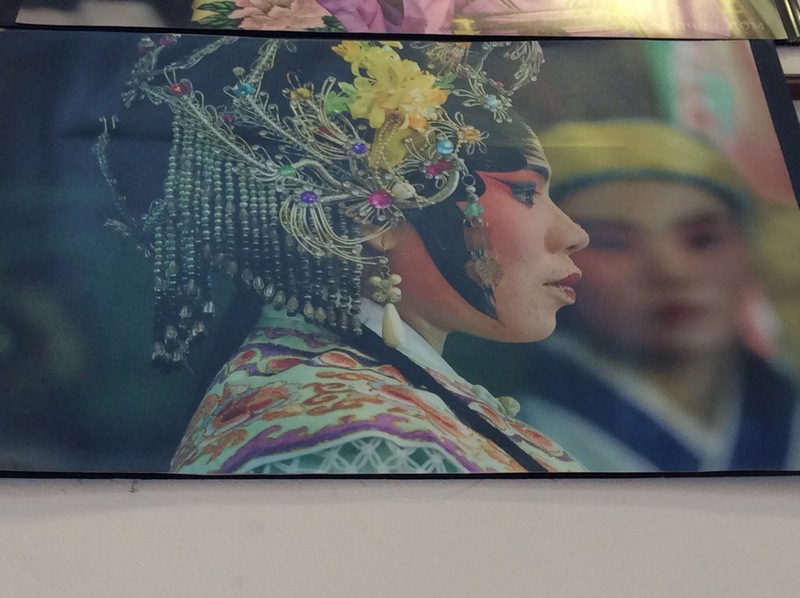 It is privately owned and operated by the the 5th generation of the Kim Giak Low Choon (KGLC) Teochew Opera Troupe. 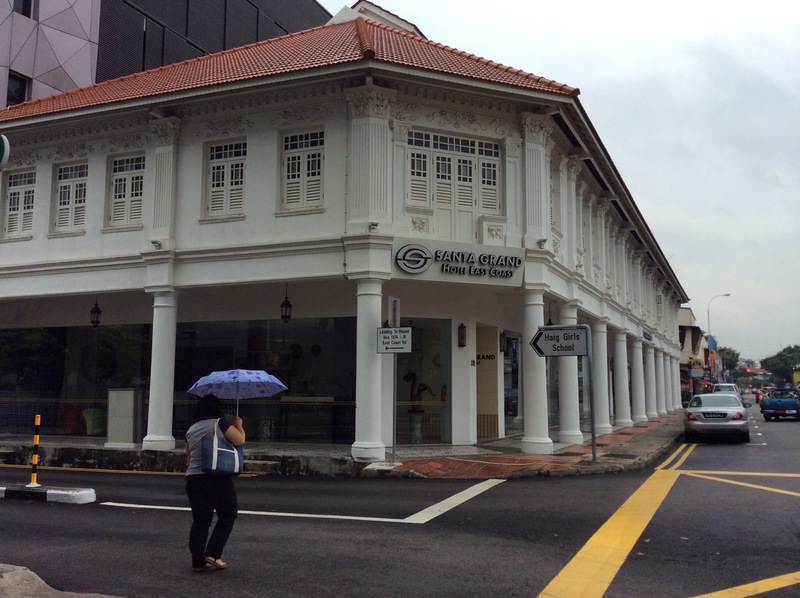 All the collections in the museum were privately owned by the Goh’s family over the generations. 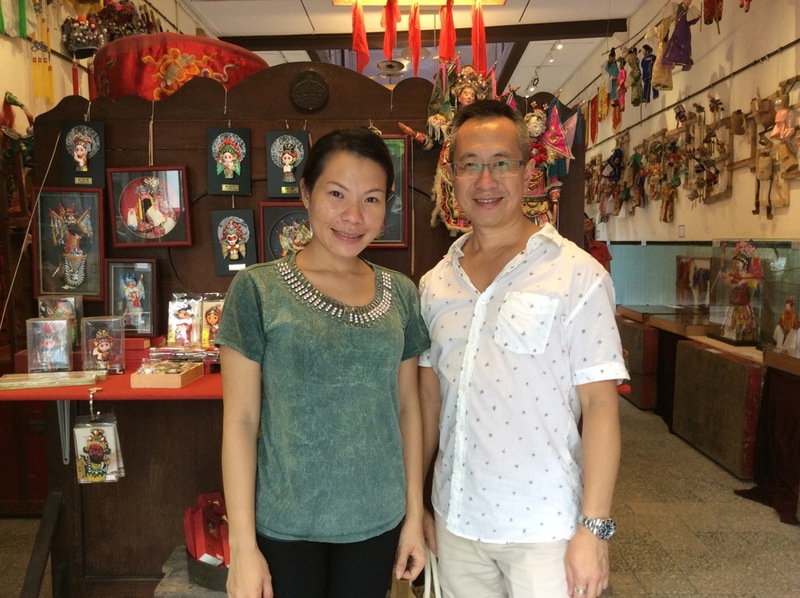 Ling Goh, the current owner, learnt her art forms from the age of 8. 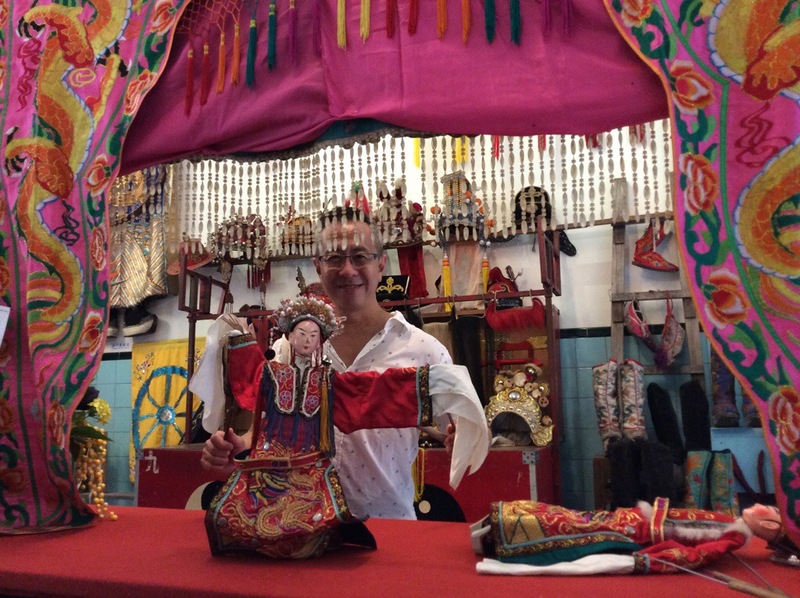 She learnt the art of opera and puppetry from her mother, who has performed in puppet show for over 50 years. She is passionate about her culture, heritage and art performances that spurred her into opening this wonderful place to share with the public. There is a small entrance fee to keep her business viable and going. I am not sure if there is any fundings from the government. I suspected there is none as this is a privately owned business driven by passion and love to preserve the art forms. However, I wish the state government, especially the tourism and cultural minister, will support and encourage a place like this. 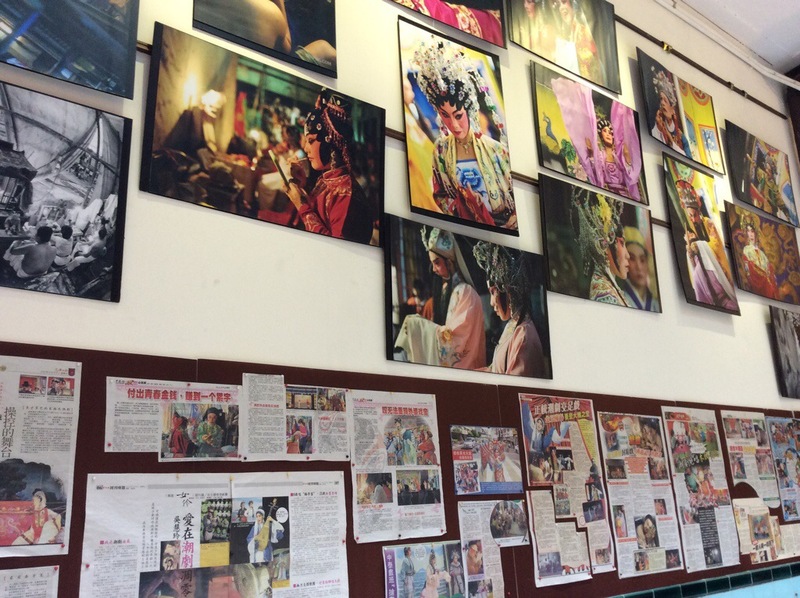 The Teochew opera or Chinese opera is one of the oldest dramatic art forms, combines literature, music and drama with elaborate costumes and lots of make-up. The singing and music have high-pitched notes. The performance comes with stories that were told and retold for centuries – A General frames a minister and has every first-born in a village killed. A jilted lover poisons the person she holds responsible for her misery. A poor farmer gets caught up, unwittingly, in the state’s secret affairs and corruption. Ling Goh usually plays the main character. Her skills are very versatile – she can performs as a woman, a man, an elderly – all of which were done elaborately through the costume, headgear and facial make-up. 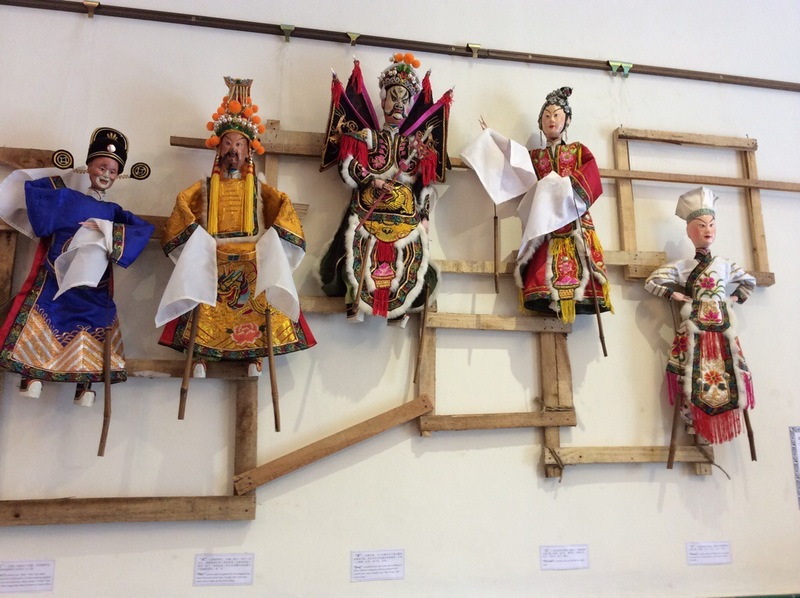 Her story is usually told through iron-rod puppets controlled by skilled puppeteers – truly a family event as Goh’s parents, brothers, nieces and sister-in-law are involved, their ages ranging from 12 to 71 years old. Her niece is now learning the art forms to carry on the Goh’s tradition into the 6th Generation! This is incredible and deserves an accolade of awards. 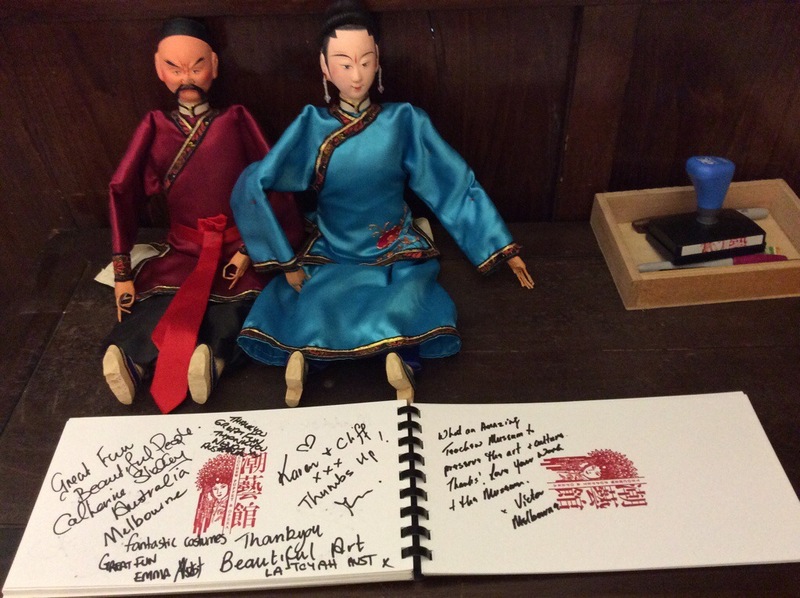 I was very lucky to have met Ling Goh and her staff and volunteers. They are very passionate and happy to share their knowledge and history. 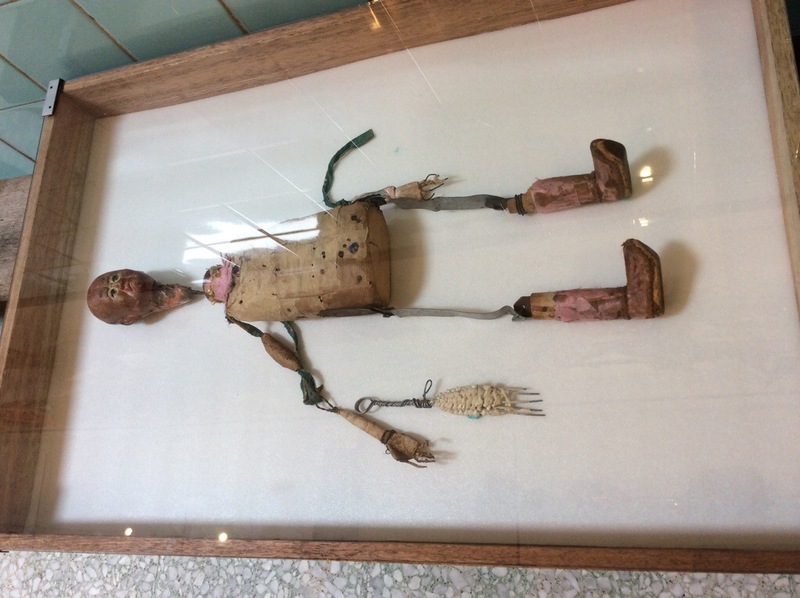 Every single piece of the collections in the museum has a story to tell. It is worth the visit and take some time to relax and have a chat with either one of them, including a guided tour of the collections. They have a Facebook Page, which you can Like to find out of their latest news and scheduled performance. 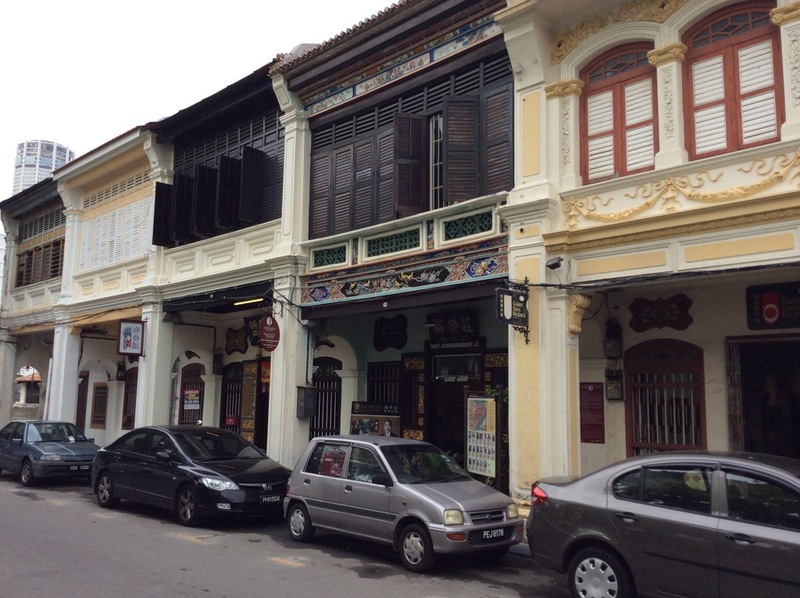 The Teochew Puppet and Opera House is located at 122 Armenian Street, George Town, Penang. 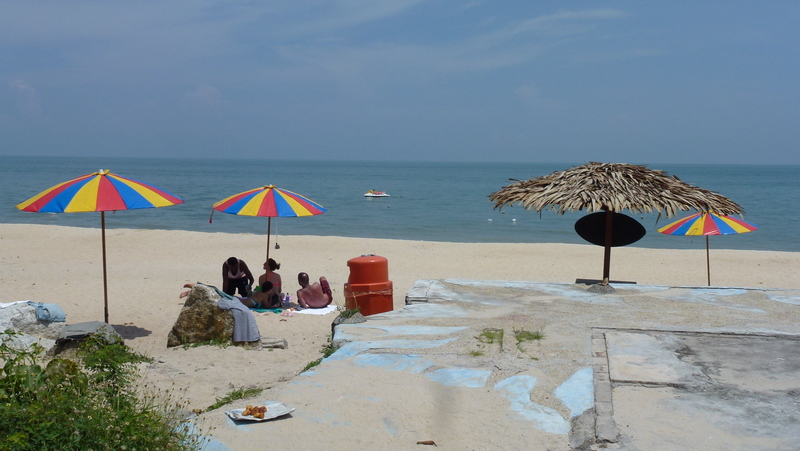 Batu Ferringhi is a popular beach destination in Penang among the tourists as well as the locals. It is not an ideal swimming beach in comparison with other better beaches in Asia. 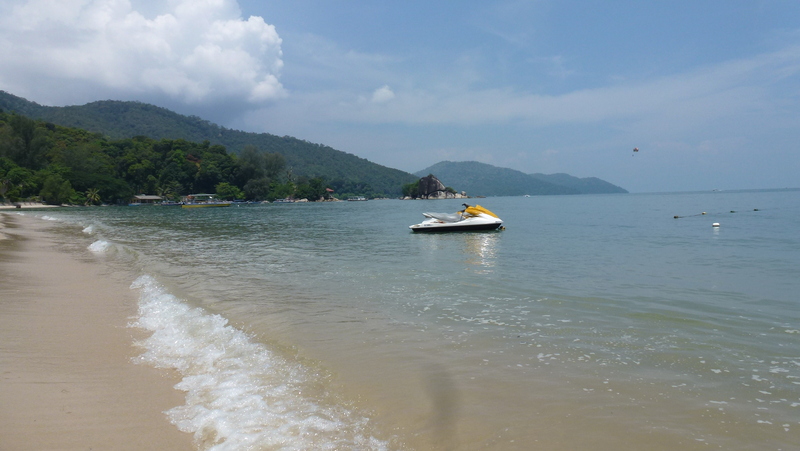 But, it is popular with some of the best and well known beach resorts including – Shangri-La’s Rasa Sayang Resort and Spa and Golden Sand Resort, Hard Rock Hotel, Holiday Inn, Parkroyal and a few more dotted along the beach from Tanjung Bungah to Batu Ferringhi. 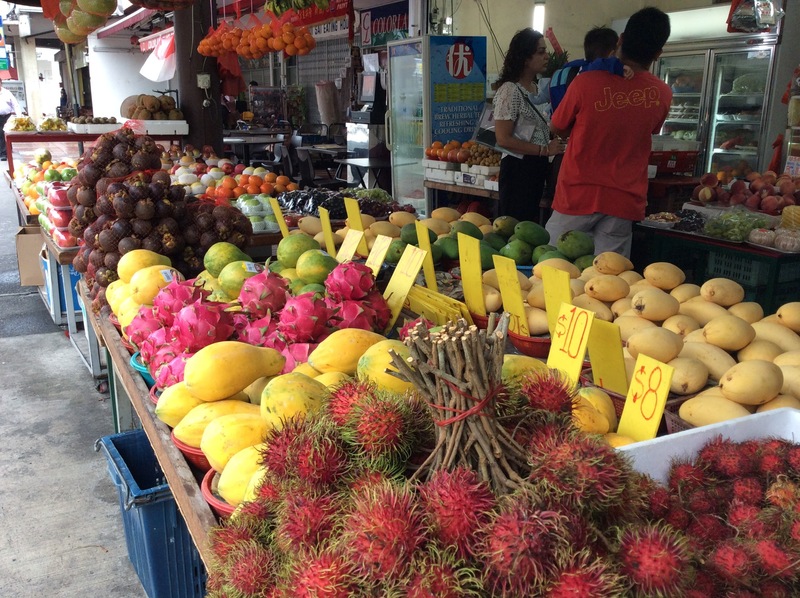 The stretch along Batu Ferringhi Road starting at the Rasa Sayang ending at the Bayview Beach Hotel is famous at night time for its “Pasar Malam” aka the Night Market, selling everything from fake watches to lady handbags, clothing and souvenirs. This is the place to buy your fake goods if you are not planning to visit Thailand; otherwise, save some of your money for serious shopping in Bangkok. Bargain is a must at the night market. This is the time to test your skill. 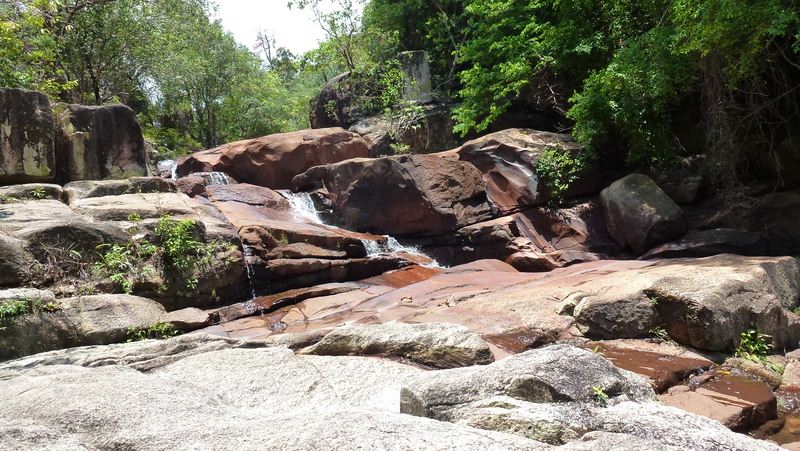 In daytime, Batu Ferringhi is quiet and layback with most tourists making their way into George Town for the heritage and culture, or shopping at one of the malls. Some will laze at the resort pool or the beach. 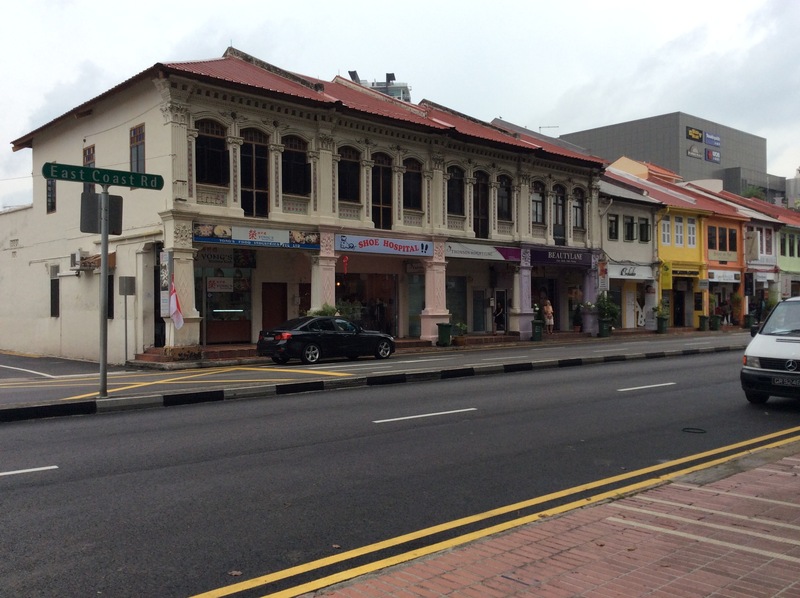 There is nothing else happening and most shops, hawker centres and restaurants are shut in the daytime. 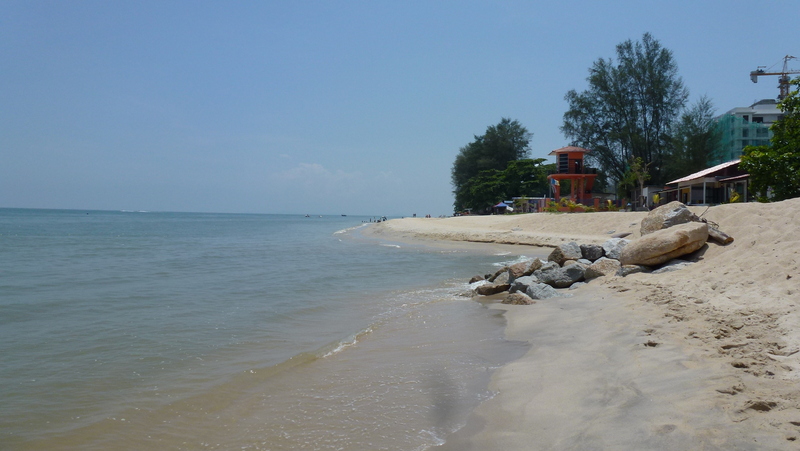 I grew up in Penang loving the beach at Tanjung Bungah and Batu Ferringhi. 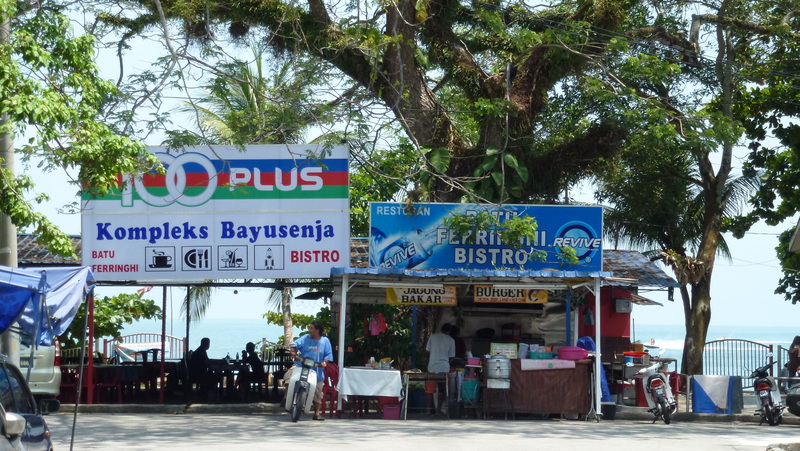 On my past trips to Penang, I will go back to Batu Ferringhi but only at night for the night market. 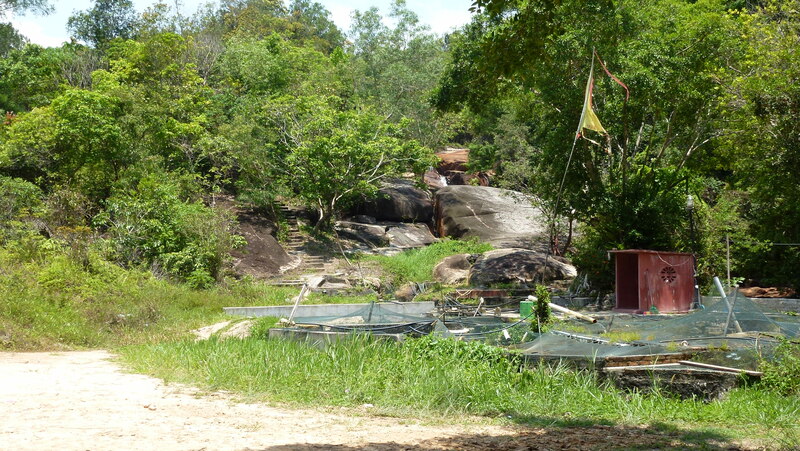 This time, I told myself I must visit Batu Ferringhi in the day to recollect my memory when I was at my teenage years. It is very easy to get to Batu Ferringhi by taking the 101 RapidPenang bus from Komtar bus terminal. It costs $2.70 Malaysian Ringgit, which is slightly less than $1 Aussie dollar. There is regular buses that run every 10-15 minutes. The trip depending on the traffic may take between 30 minutes to 45 minutes. 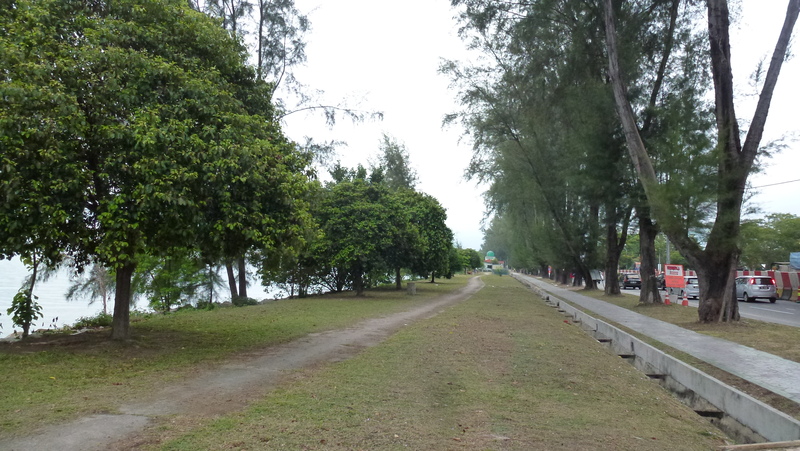 The road leading to Batu Ferringhi is winding next to the coast line. Be prepared for a thrill in the bus as the driver is used to the winding road, driving at fast speed. All the hotels along Batu Ferringhi road is on the beach, except one of Holiday Inn’s building which is on the left with a connecting sheltered pedestrian bridge to the other building at the beach. 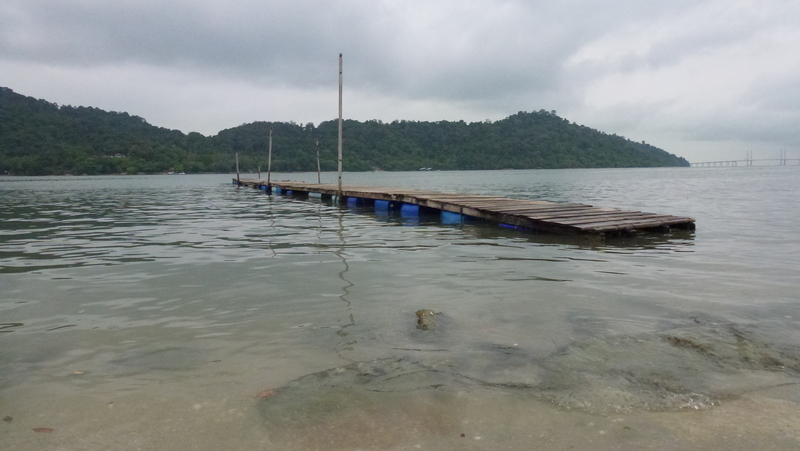 Get off at any of the stops after the Rasa Sayang Spa Resort. I stopped right after the Holiday Inn in front of Park Royal. 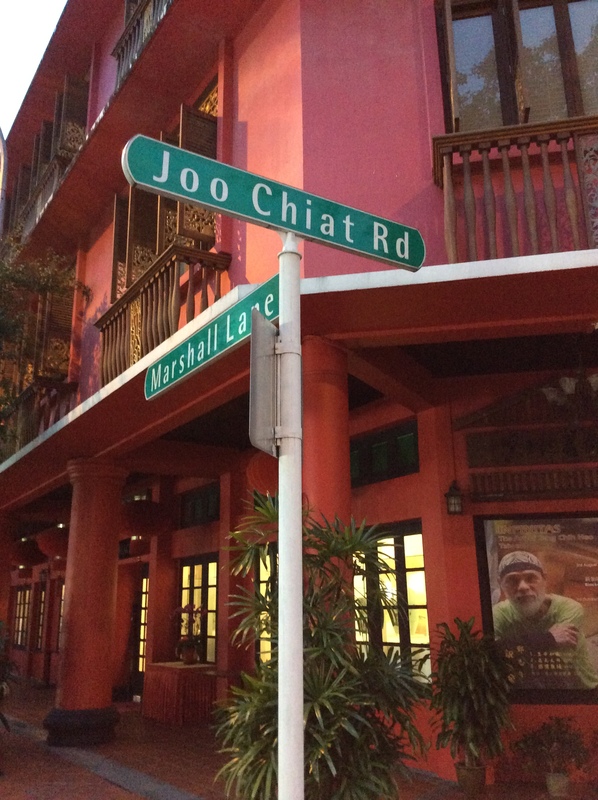 There is a small street leading to the beach after Park Royal. 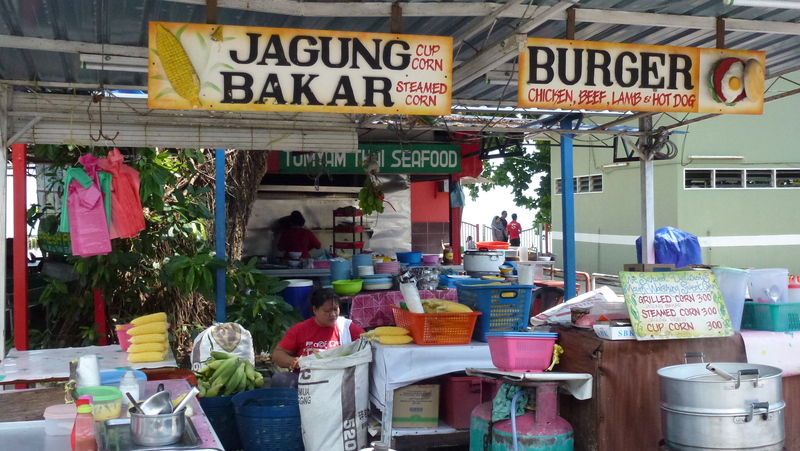 You will see a few Malay food stalls. The thing I like most about Batu Ferringhi is the sand. It is very fine and soft. On a hot day, which is almost everyday, walking on the sand is like walking on a hot burning coal! I had to sprint my two little feet as fast as I could to the cooler part of the beach, which is either in a shade or near the water. The day when I was there, it was a Friday. 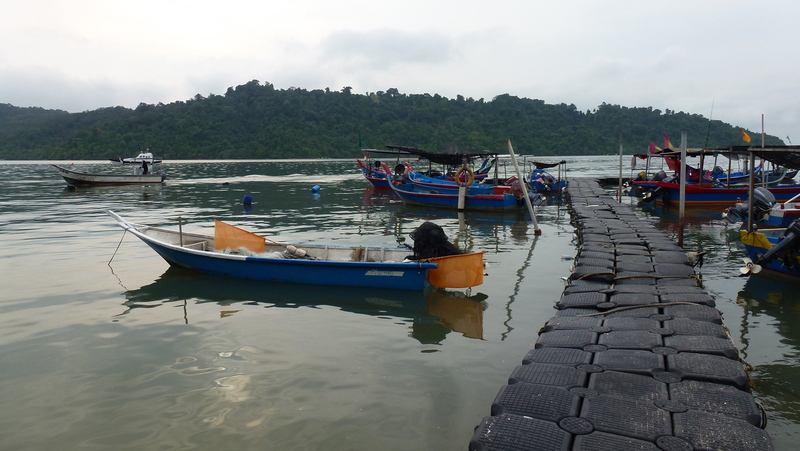 It was quiet with occasional tourists and some local Malays. After a long walk on the beach and sweating like mad with a sticky body, I walked back onto the road. 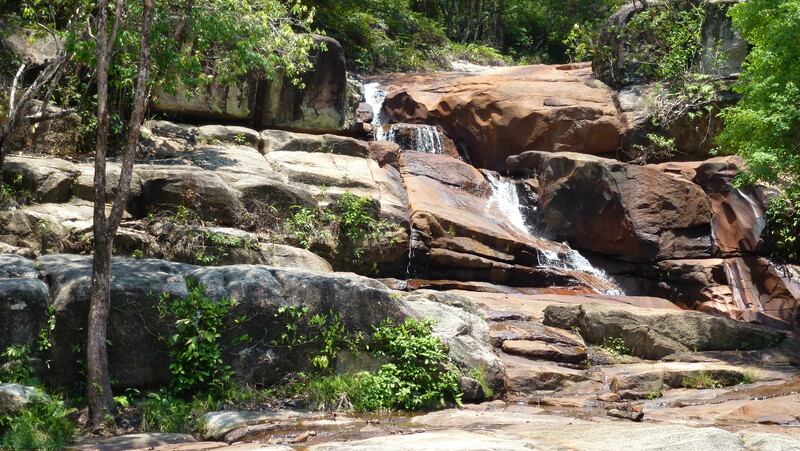 I remember there is a small waterfall that I used to go for a bath after swimming at the beach. It is a short 15 minutes walk from the road across from the Bayview Beach Hotel. 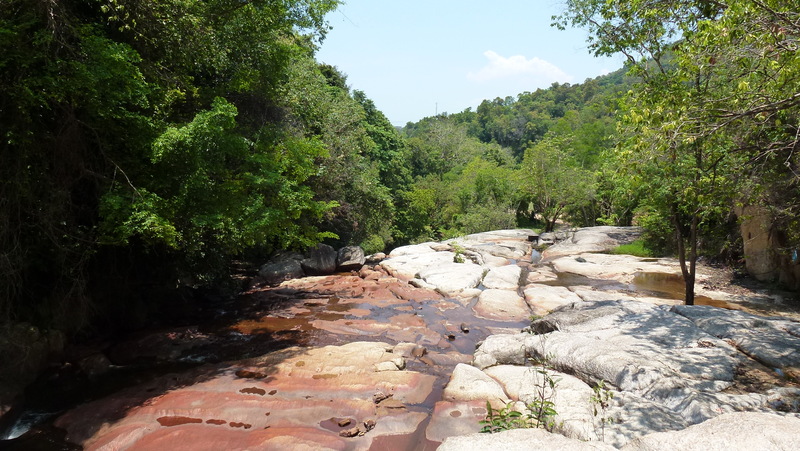 There is no sign as there is a private property below the waterfall that belongs to a Chinese family with a small fish farm. I don’t remember seeing this place when I was there the last time, which was probably more than 3 decades ago. There was a bit of construction happening in the area with a bulldozer clearing some rocks and dirt, which is unfortunate as the area was covered in greenery in the past. 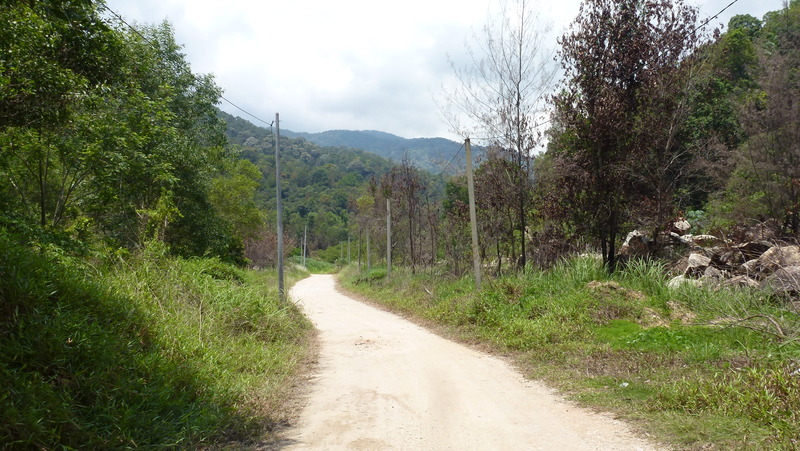 Now part of the walk, I could see some destruction to the virgin jungle and track. 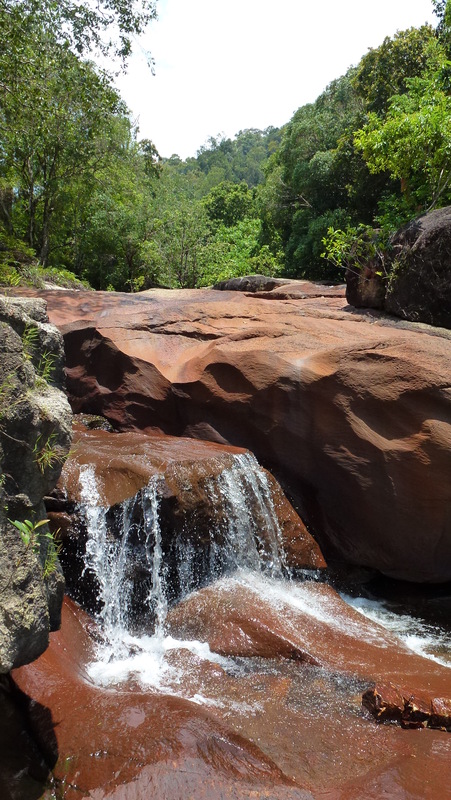 I was lucky that there was water cascading down the small rocky hill. 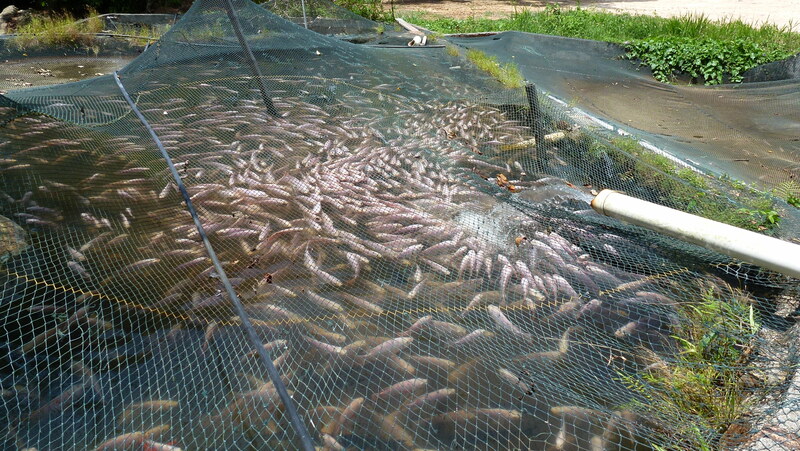 During the dry season, it can be quite dry. It was peaceful and quiet. 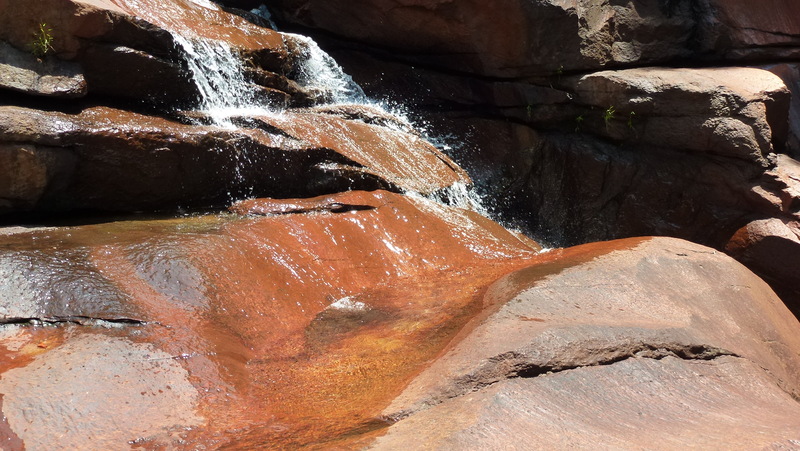 I had the whole place to myself, sunbathing for a couple of hours, cooling down in my own “organic” bath tub with the waterfall showering onto my head and shoulder. It was as close to the nature as I can get in Penang on this trip. A memorable moment to cherish for a long time. 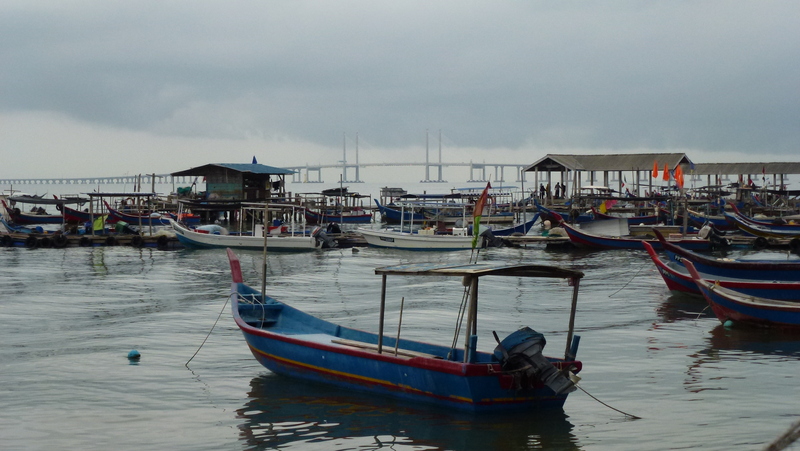 I woke up one morning in Penang looking forward to my walk along the east coast of Penang island. 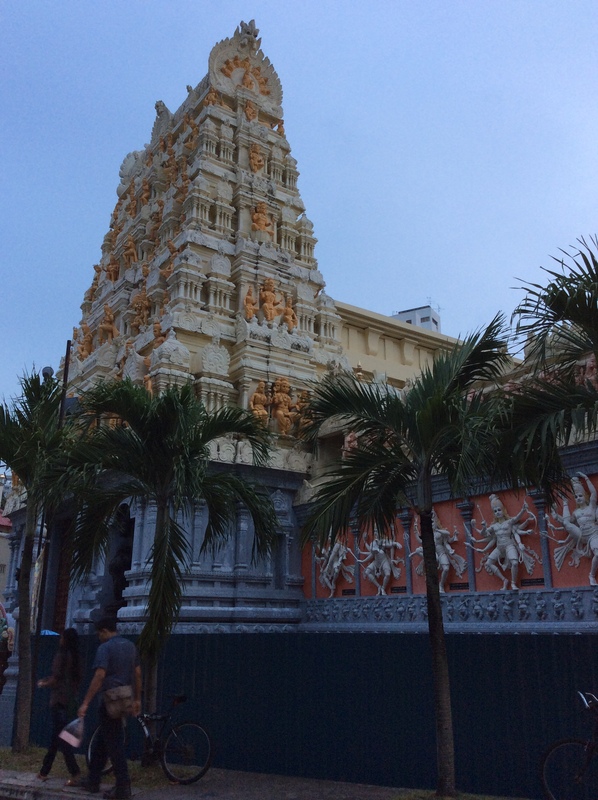 There are not that many places to go for a nice morning or evening walk in Penang. 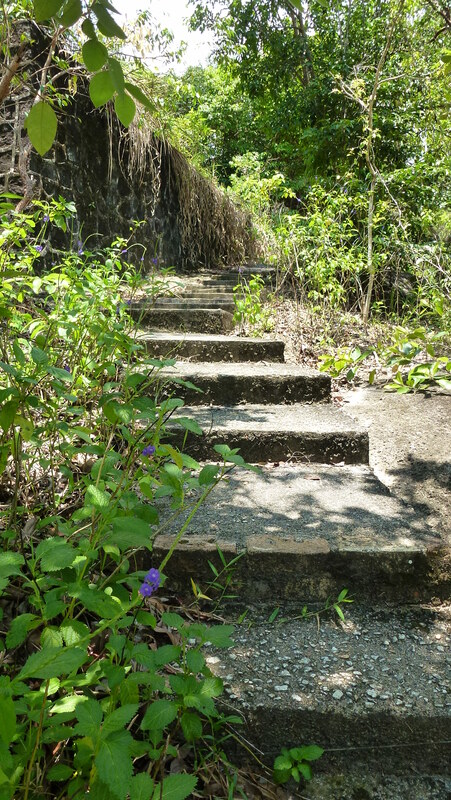 Most locals will walk around the Botanical Garden or up the Penang Hill for the cooler climate. To do that one will need to either drive there or lucky enough to live nearby. I love walking and looking at the scenery. 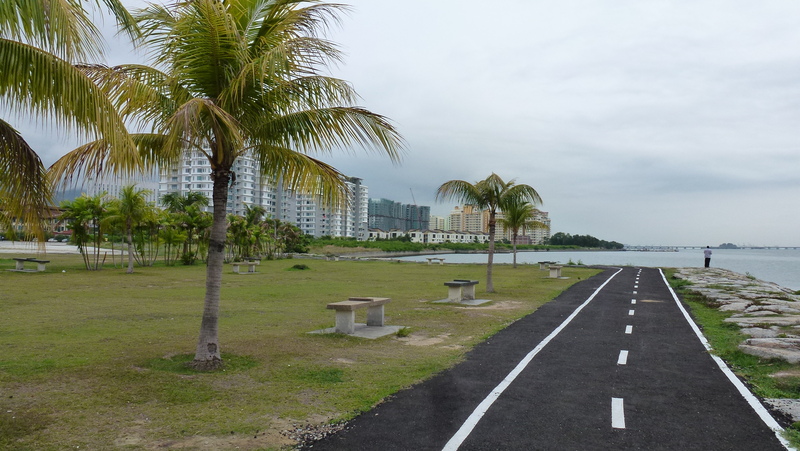 At the Queensbay area, which is fast becoming overdeveloped with more and new high rise apartment living has a nice walking and bicycle track. 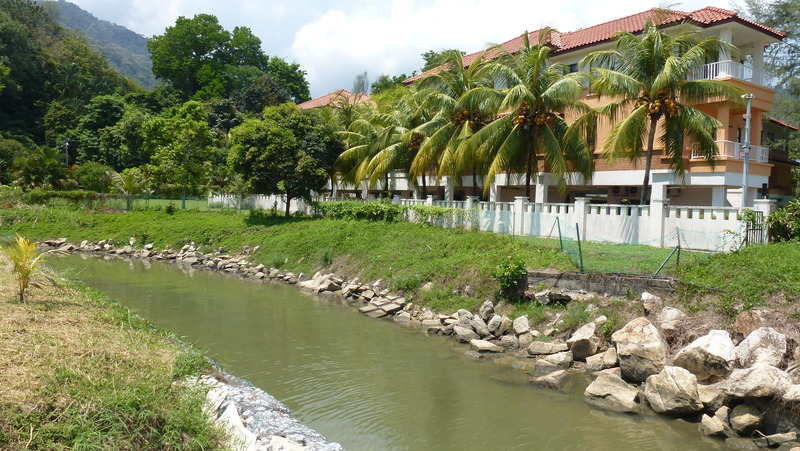 This track was recently built to promote a better and healthy lifestyle for the residents living in the area. It is not a long track but good enough for a start. An easy 20 minute walk from one end to the other end. Eventually this track will continue all the way to the city. 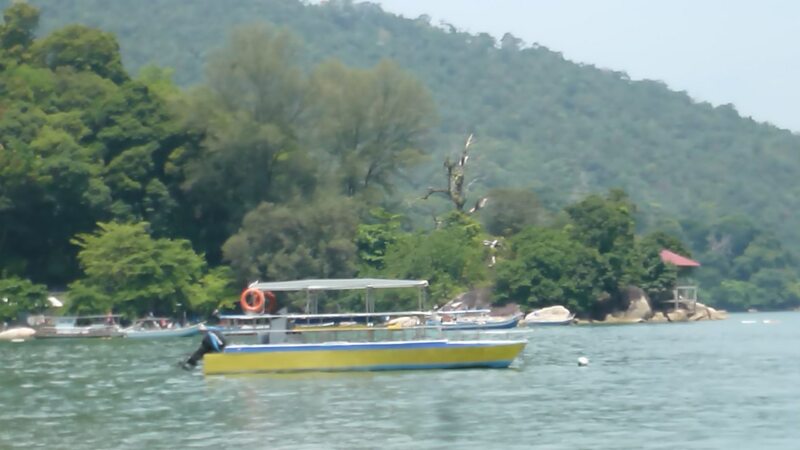 It is a lovely spot to sit, relax and watch the sun rises from behind the small island “Pulau Jerejak” across the channel. Unfortunately there are not that many people taking advantage of this public space in the morning. However, it is different in the evening. 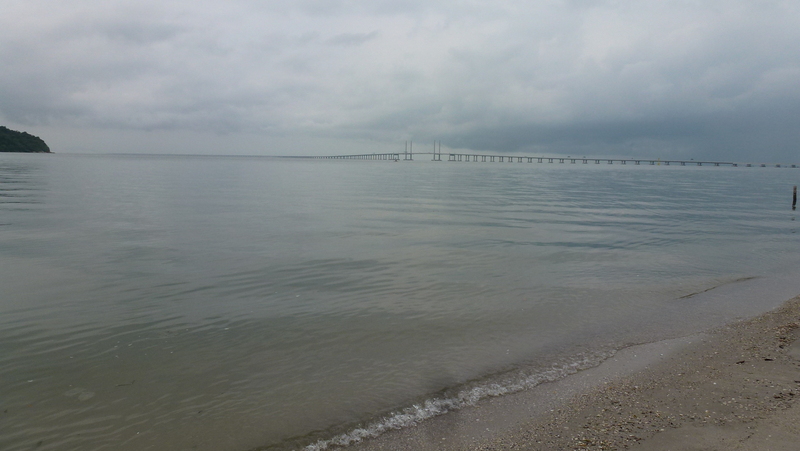 It is extremely popular with the locals who come usually in a small group sitting on the many provided benches to enjoy the view of Pulau Jerejak, and the 2 Penang bridges – the oldest one towards north of the island and the recently opened 2nd Penang bridge towards the south which is the longest bridge in Southeast Asia spanning approximately 24 km! This morning, I was interested to explore and find out how far I could walk along the coast towards south without taking too much risk on my life as the busy motorway runs alongside the coast line. I was glad that I have done it. No crazy local will do what I did. I was the only person that could be seen walking along the coast line among the heavy morning traffic with commuters rushing to work. 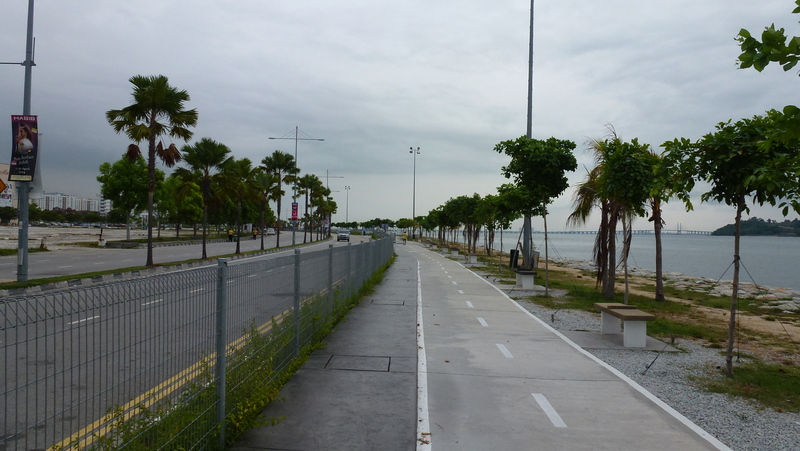 Starting the walk at Queensbay was a safe pathway for pedestrian. However, once it ends I had to gingerly stepped onto the beginning of the motorway and walked as close as possible to the side a few metres from the beach. There are a few obstacles. The beach doesn’t stretched all the way. It ended with some rocks and a wide stormwater discharge into the sea. There are a few trenches which I had to perform my little jumped. I am pleased to see that there are decent footpath after a couple of km walks. 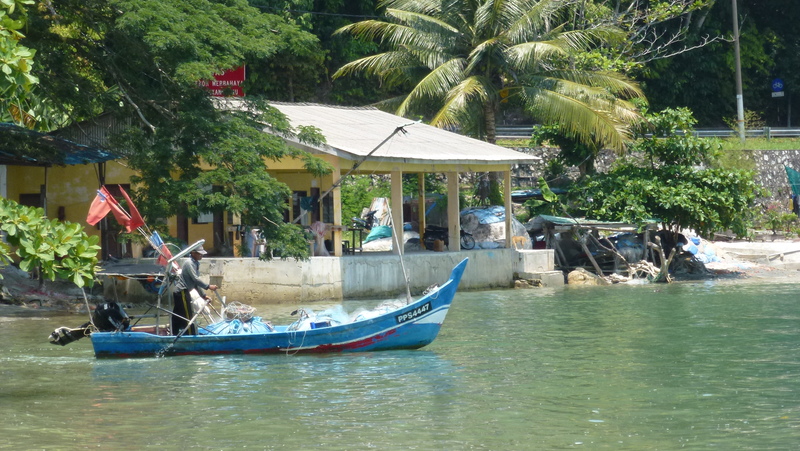 The view was nice looking across the channel to the Jerejak and the new bridge, a Malay fishing village with colourful fisherman boats, a few Malays rod fishing. 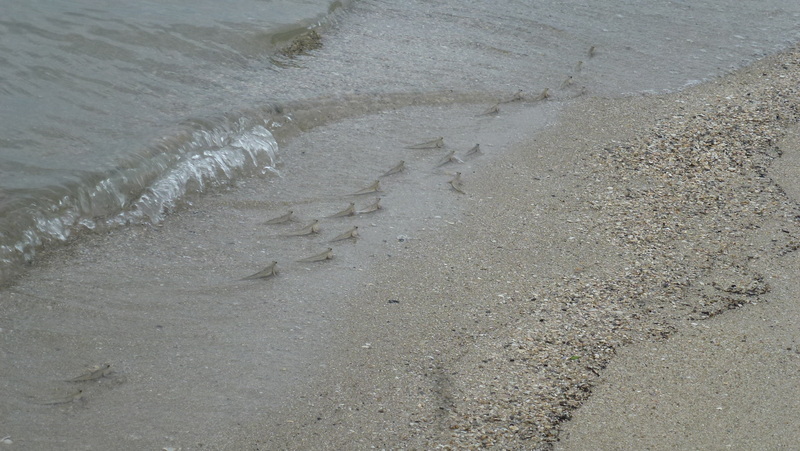 On my way back walking along the beach, I saw a few little amphibious fish skipping in group. They are the most peculiar little fish with big bulging eyes that breathe out of water. 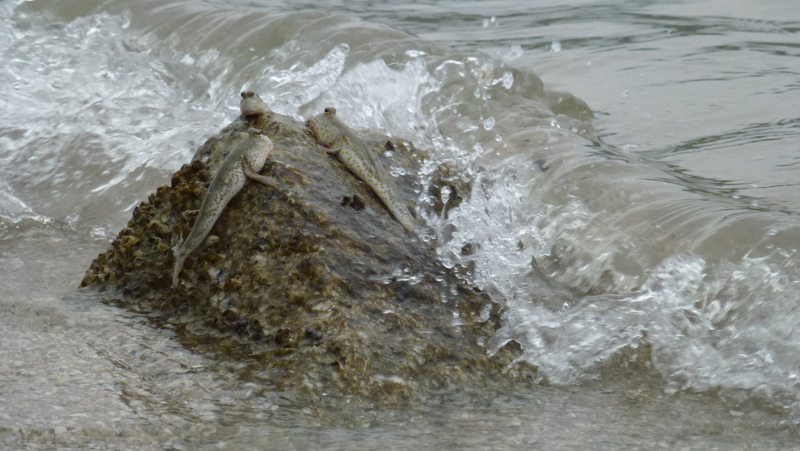 I am thinking they are mudskipper or walking fish. 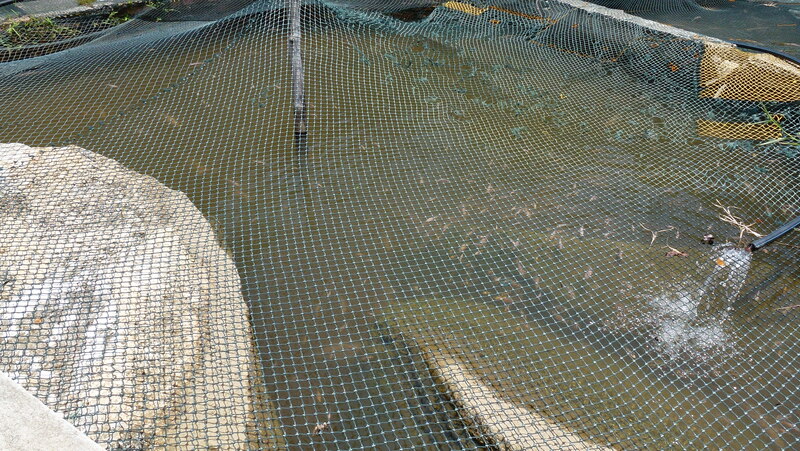 Some of them were resting on small rocks. Their fins must be pretty strong for them to hold onto the rock without being washed away as the waves crashed against the rock and their bodies. They seem to be having a great time. The walk took me 2 hours with intermittent stops to take some photographs. Will I do it again? Probably not. It was noisy with the heavy traffic. 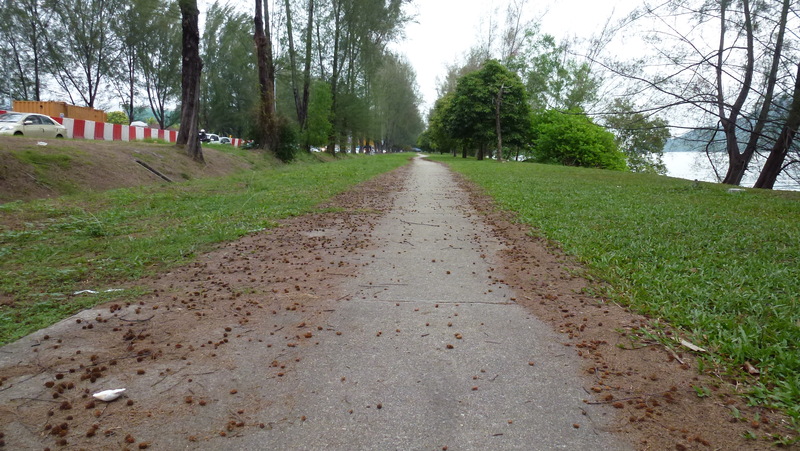 I will stick with the nice and safe pathway along the Queensbay coast line. That is the name of the place. A catchy phrase, pop culture or just hip and trendy…probably all in one. 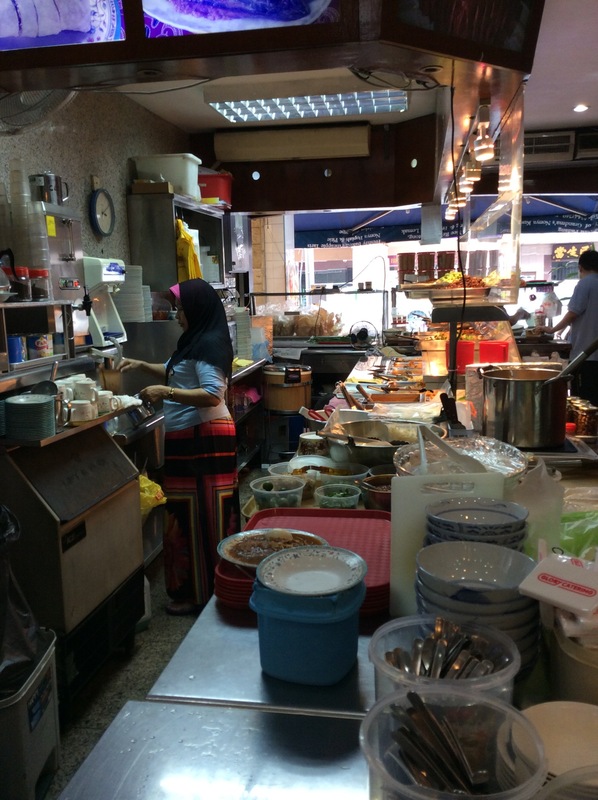 It is an unassuming place in a standard block building in a suburb surrounded by other shop lots of food eating places in a residential neighbourhood in the southeast of Penang island. 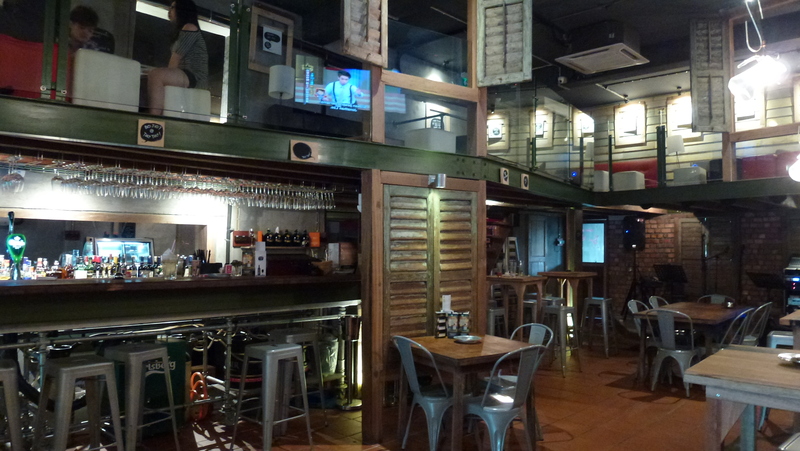 This trendy, rustic and arty place with a wine bar that looks something like a western movie set “saloon bar” would be more suited for the old part of George Town in the city amongst the boutique hotels, galleries and cafes. 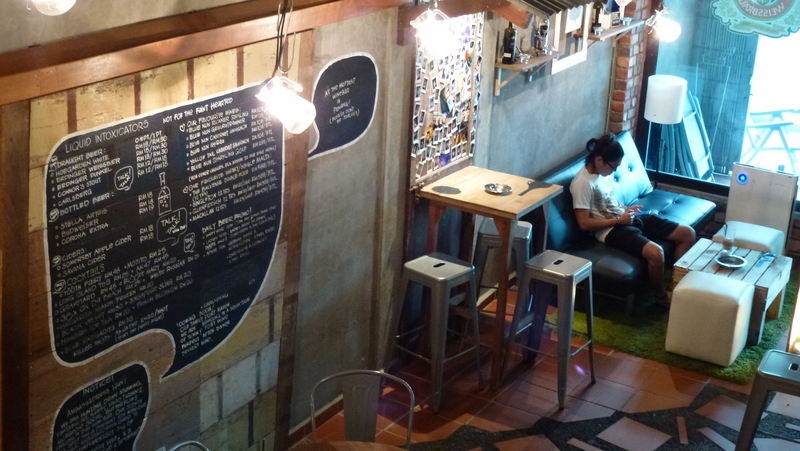 The place started off as “Tok Tok”, a small single shop lot café of fusion style food with a Thai-Chinese crossed Nyonya local Penang fare. It was last year when I first stumbled upon this place with my partner, my mum and sister. 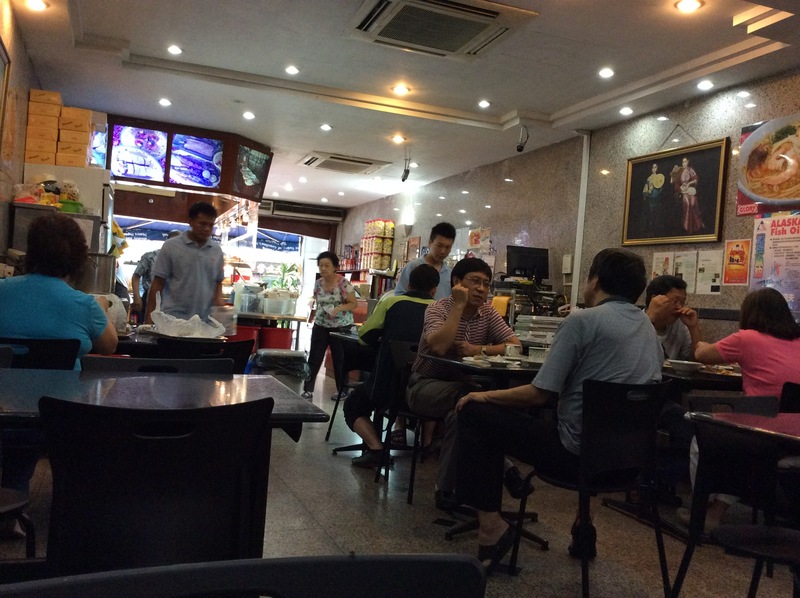 We frequented that area for the food at a Chinese restaurant, “Wang Chao“. But it was shut and we decided to try “Tok Tok” which was a couple of shop lots from Wang Chao. 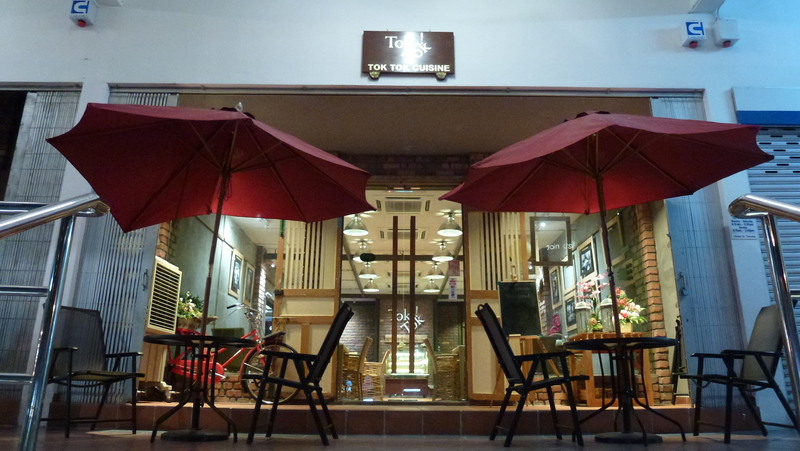 I had good memory of the place, the food and the service. This morning I caught up with my mum and sis for an early breakfast. 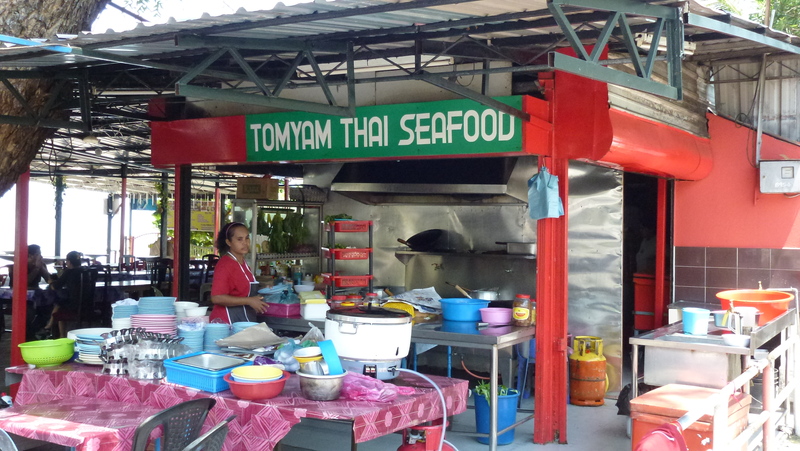 After a local Penang all time street favourite, “Char Koay Teow”, I went for a walk around mum’s local wet market. It was a small market but each individual stalls was a delight to look at from fresh poultry to fishmongers, fresh flowers, vegetables and herbs, fruits, wet and dried spices, fresh grated coconuts, cream, milk, organic food, snacks, biscuits, Taoism religious and prayer matters. I was tempted to buy a few things. 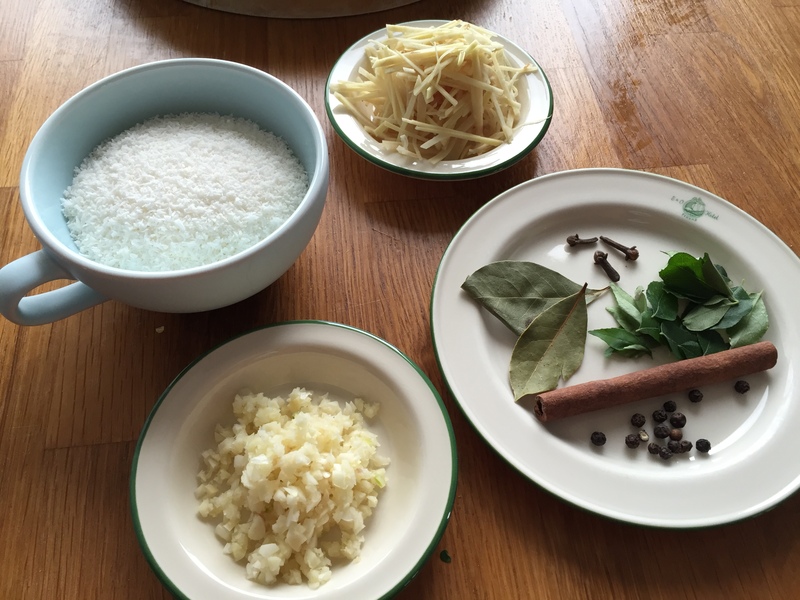 In my mind – fresh grated coconuts, coconut milk, ready mixed wet chilli and curry pastes, fresh turmeric, fresh tofu…the list goes on. But wait! I can’t take them home to Australia. I opted for something less to satisfy my urge – a packet of organic red rice and “sugar cane” sugar. I was thinking of the organic cold pressed coconut oil, but remembered that I am going home with only a hand carry bag. No check in luggage! After a whirlwind of wet market, I told mum that I will take her and sis out for dinner tonight. 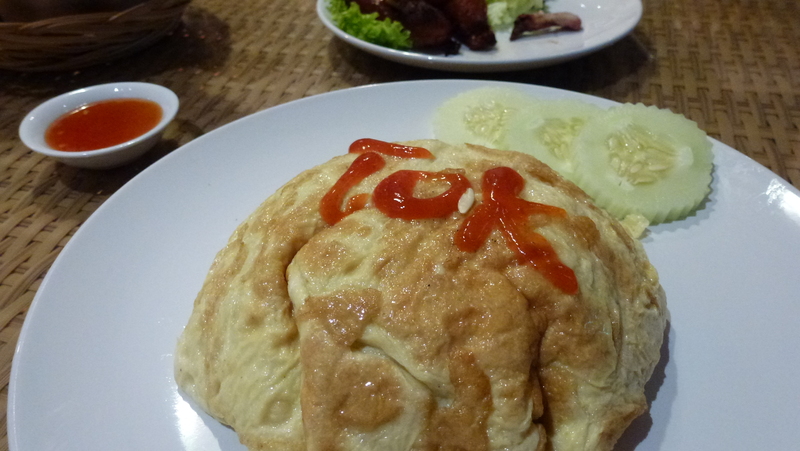 It was her idea that we go back to Tok Tok, because she remembers that I enjoyed the food the last time. For a 78 years old lady, she has a better memory than me! 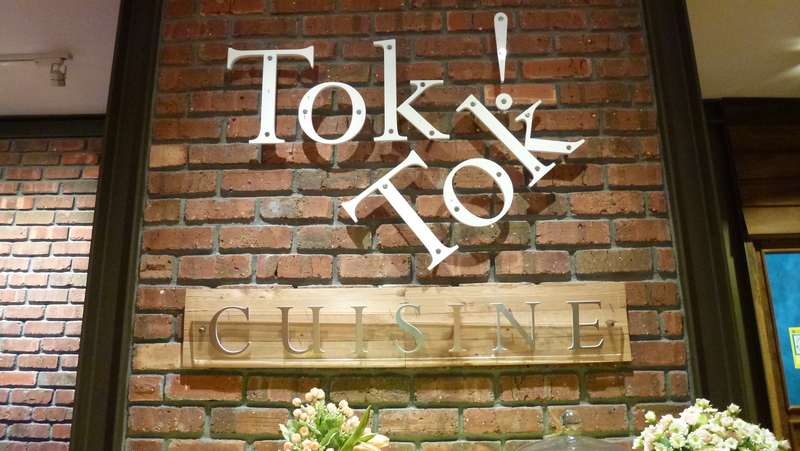 Tok Tok is the sound of “tok tok mee” or wanton mee. 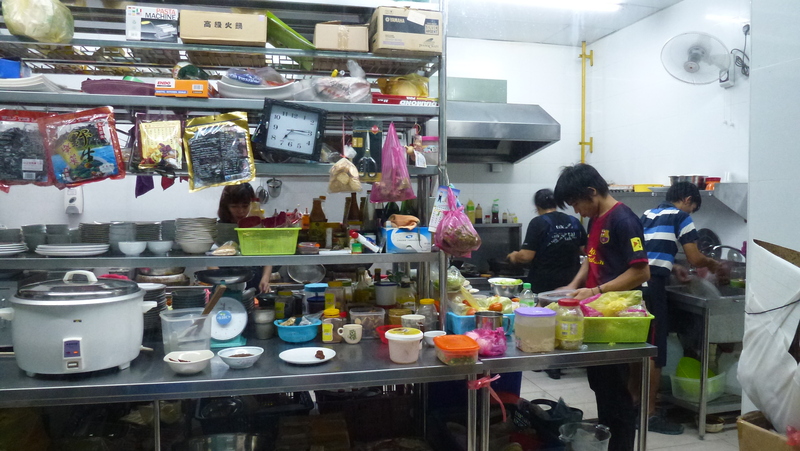 “mee” is “noodle” in the local Penang dialect, Hokkien. 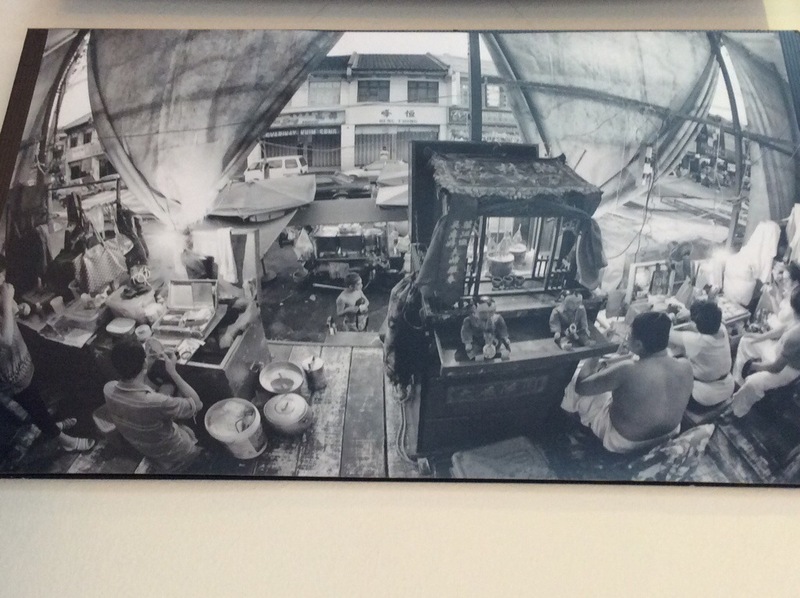 A memory flashed back to old Penang. There was a street vendor who pushed his cart in the neighbourhood selling his wanton noodle by making a distinctive “tok tok” noise by banging a pair of bamboo sticks on the surface of his cart. This was to let the people know that he is getting near to their home. I remember hearing this “tok tok” noise and will yell out to mum that the wanton man is here! How easy was that? The food came to your doorstep in the old days. Even a wondering Indian Barber with his high chair wooden stool! 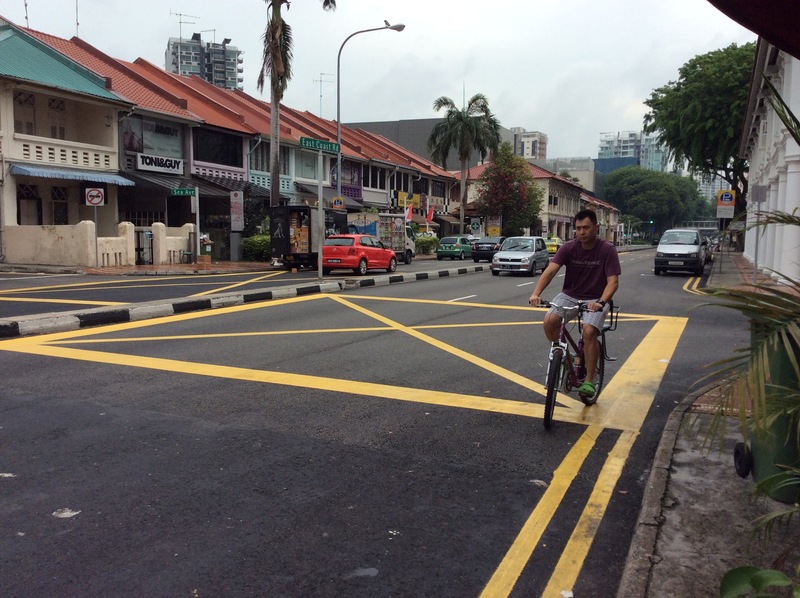 The modern day “Tok Tok” at Bangunan Lip Sin at the Pekaka neighbourhood is nothing like the old “tok tok” days. 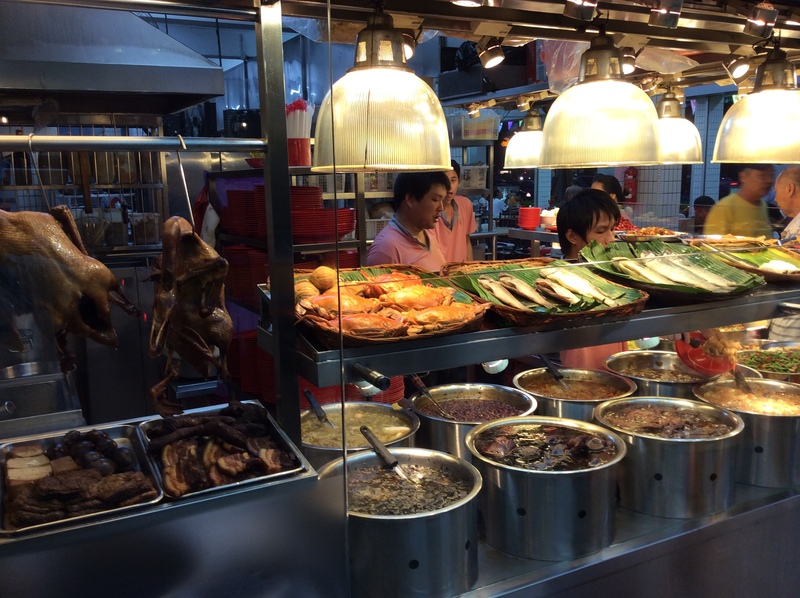 There is a generous size ala carte menu with some Penang famous street food fare including as you would expect, “Tok Tok Mee”, Nasi Lemak, Siam Laksa, Lor Bak, Sang Mee and others. 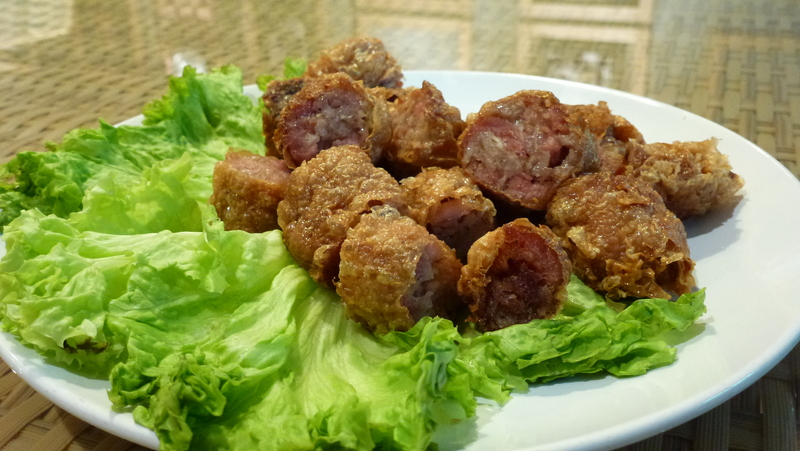 There is rice dishes which focus mostly on Thai and Nyonya dishes. 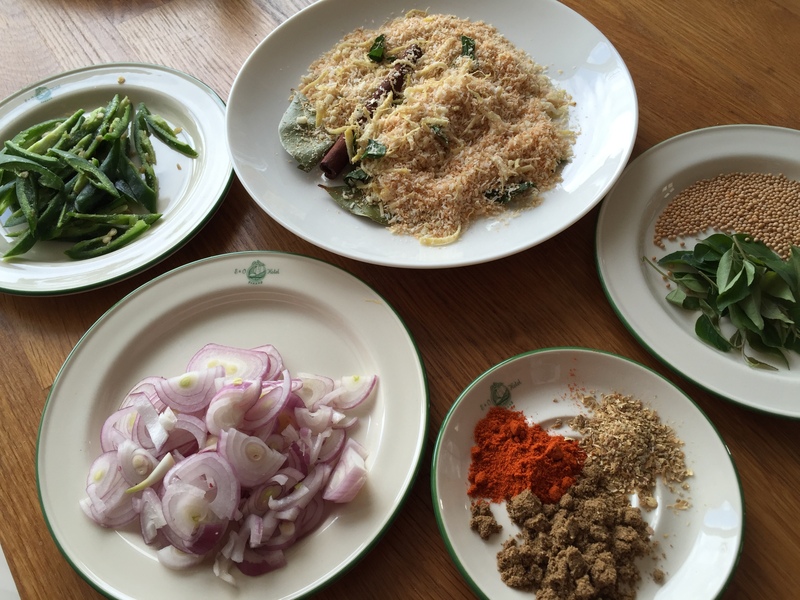 We ordered dishes to accompany with rice – Loh Bak as entrée, a salted vegetable with tofu soup “Kiam Chai Tau Hu Teng”, deep fried Siam chicken, Pattaya fried rice and mixed vegetables. For drink we ordered a homemade warm beancurd drink. 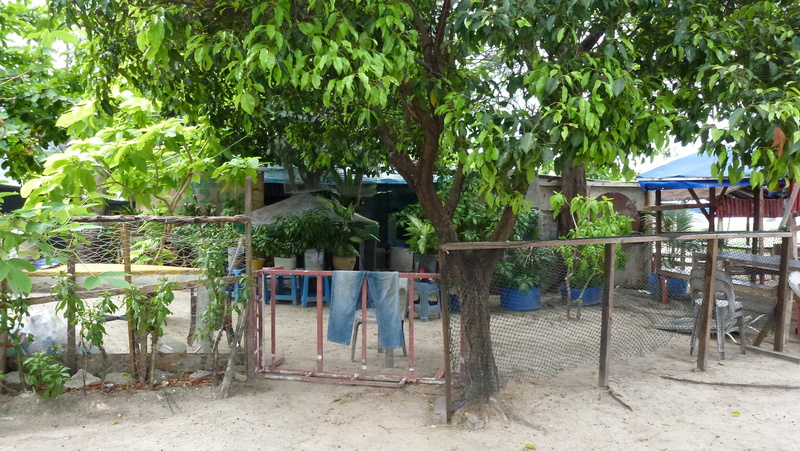 After we have ordered, I looked around the place which has now been extended into 2 other shop lots next to each other. 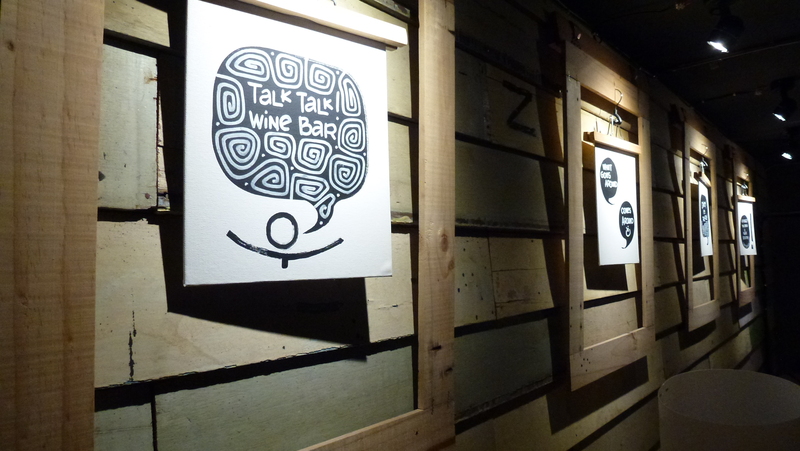 The immediate left shop is “Talk Talk” wine bar featuring a live jazz band on a weekend. Next to this is a more relax coffee lounge. All three are interconnected inside. There are opened atrium upper floor seatings. 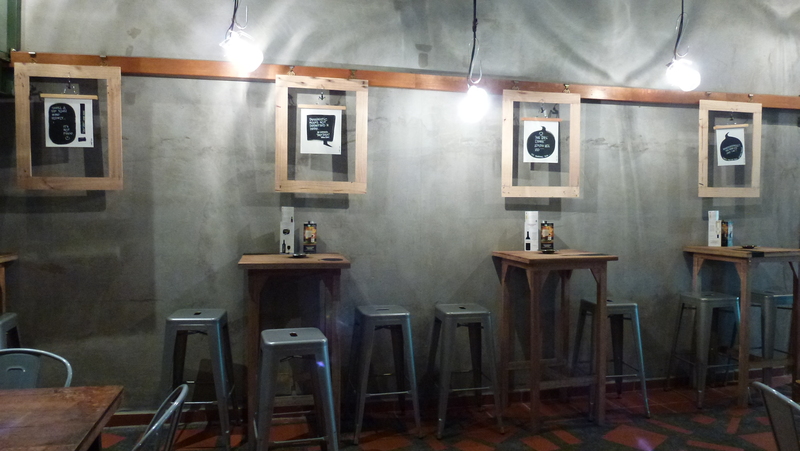 The place is hip, trendy and cool. I would love to come back next time to listen to some live music. The food…they were delicious! 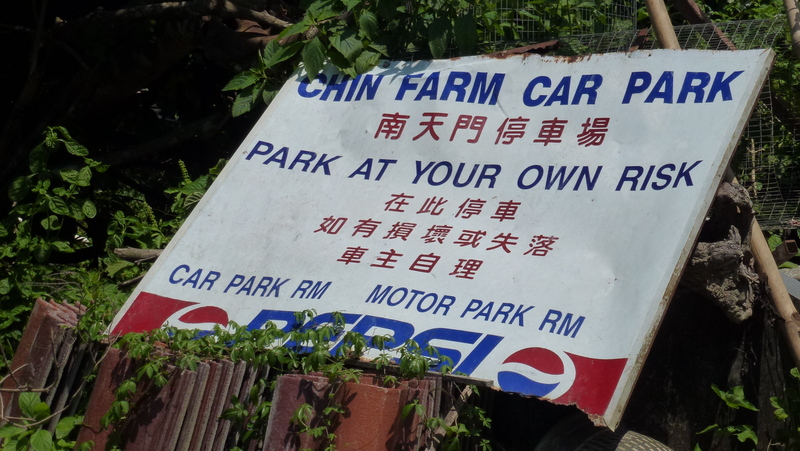 The only let down for me was the Loh Bak. It was better the first time I tried it last year. I don’t believed they were freshly made tonight. They were hard and overcooked. Probably been deep fried a few times. They were served on a bed of very old lettuces. It was not a good start when it first came on the table. But I was very glad that the rest of the dishes were top notched! They were very good. 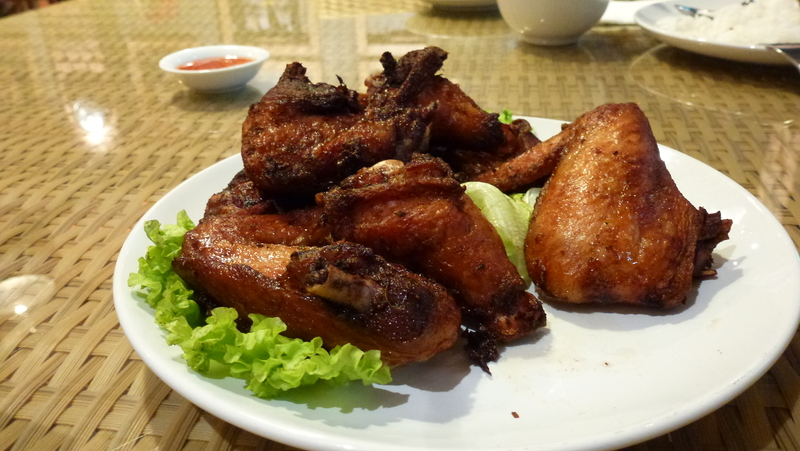 The highlight was the finger licking good crispy and crunchy chicken and yet moist and tender inside. One of the best deep fried chicken I ever had for a long time. Next was the nyonya style “Kiam Chai Tahu Teng” ie the salted preserved vegetable soup with silken tofu. 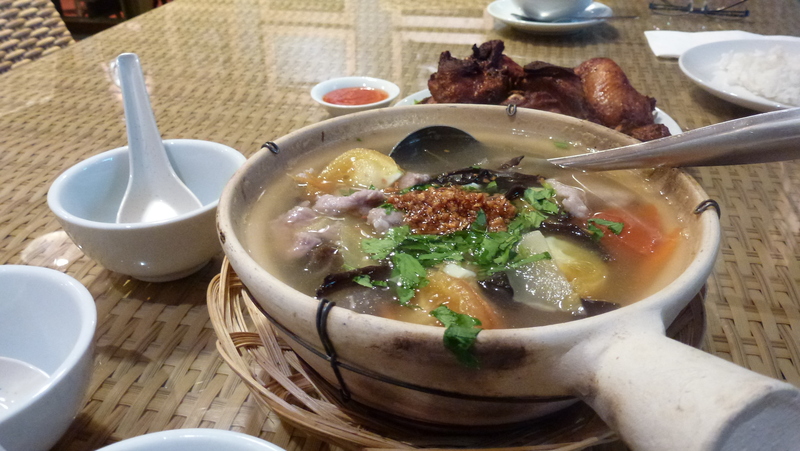 It arrived in a steamy, bubbling hot claypot with heaps of fried garlic on top giving the soup a nice all round flavour. 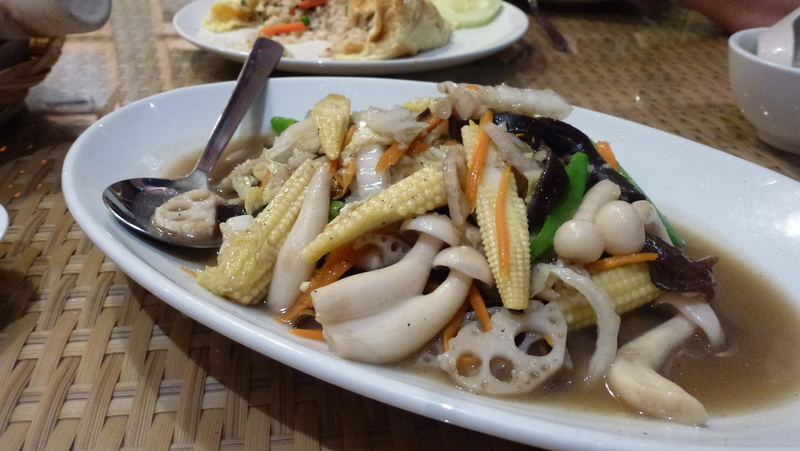 It was salty, sweet and tangy with slivers of fresh ginger in the broth. . 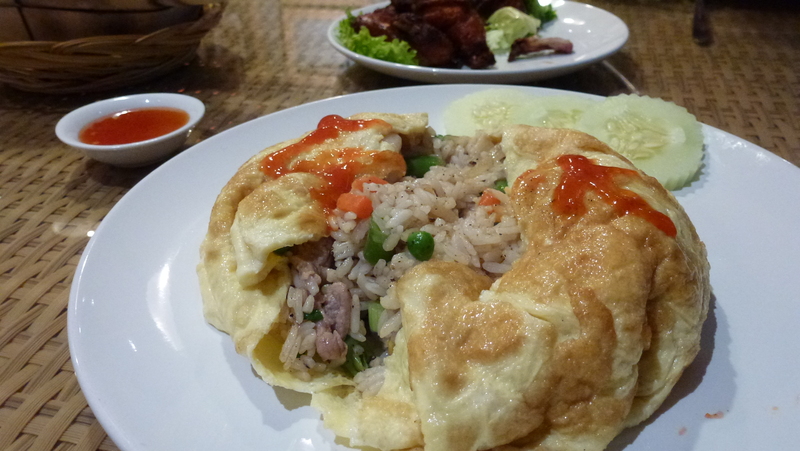 The mixed vegetables and Pattaya fried rice were also very good. I must say I have ordered too much for 3 of us, but like most places they allowed us to take home what we couldn’t finished. The food was a bit pricey in the area. The total bill came to $115 Malaysian Ringgit but still a very good value for what I couldn’t get in Australia, roughly $40 Australian dollar. The other thing that impressed me was the commercial kitchen. It is enclosed in glass wall as you walked to the toilet. It is like a showroom which you can watch the kitchen in action – well organised and clean. I gave the “Auntie” who cooked our meal two thumbs up for her food. 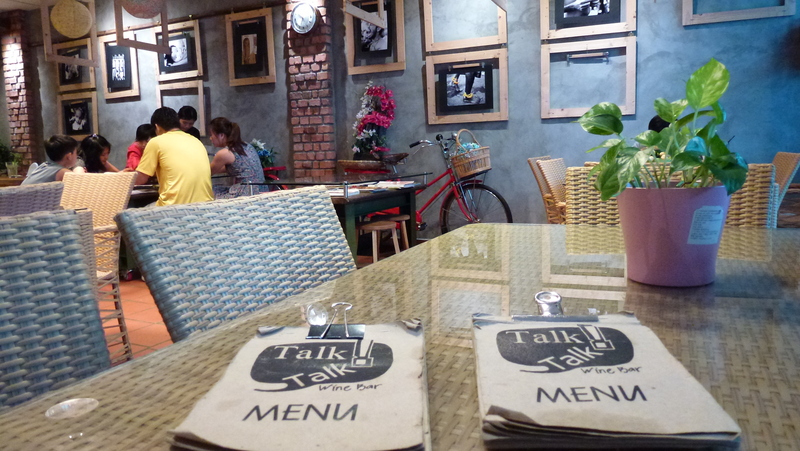 “Tok Tok” and “Talk Talk” is certainly the talk of the town in Pekaka and the surrounding suburbs. If you haven’t been there yet, I suggest you better go for “Auntie” homecooked meal. There is nothing pretentious and she was a bit shy if you try and snap a photo of her through the glass wall. Foodtrail is about food for people who love eating food, experimenting with new and delicious ideas, and seeking that holiday destination. If you love food and travel, and love sharing your ideas and experiences then this is the place for you. 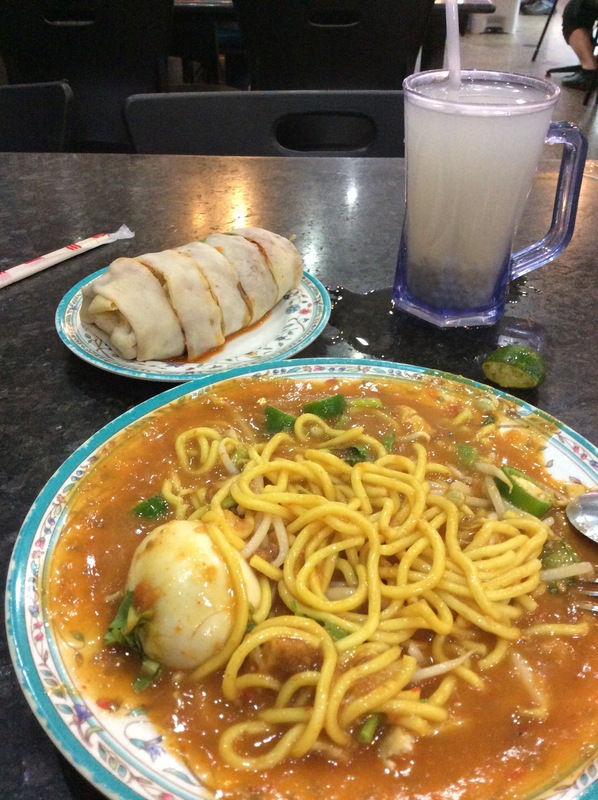 Malaysian Bloggers – "Food Fetish"